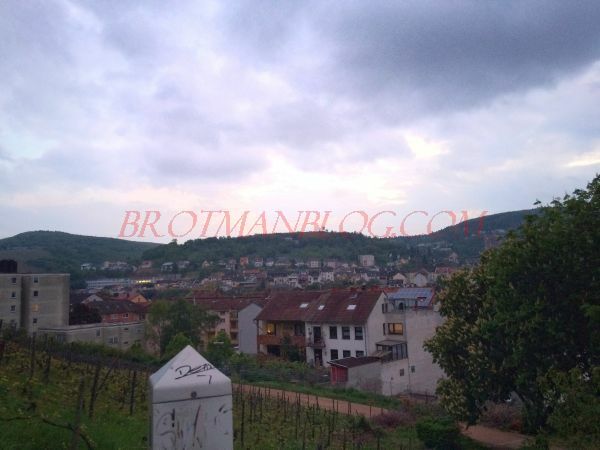 You might want to open a bottle of wine as you read this post. 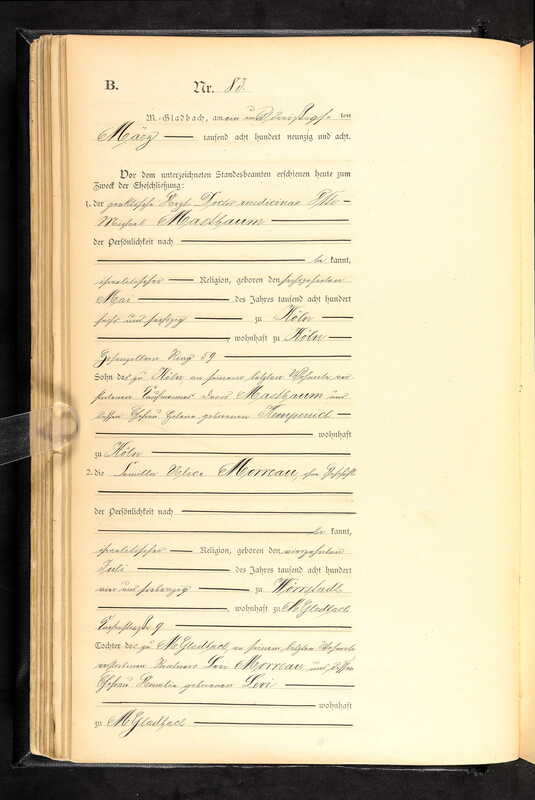 As I wrote last time, Caroline Seligmann (my 4x-great-aunt) and Moses Morreau had two children, Levi and Klara. 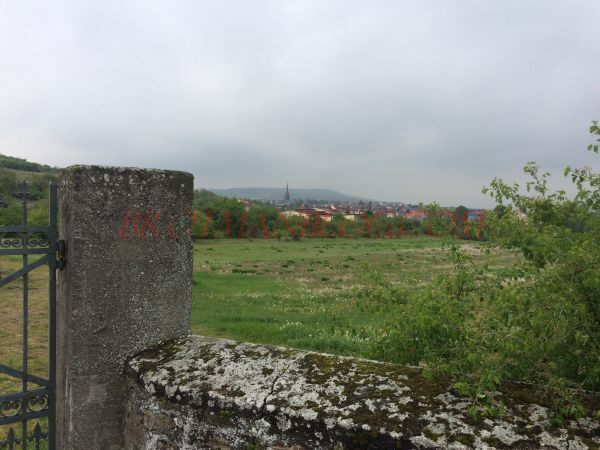 This post will focus on Klara and her descendants. 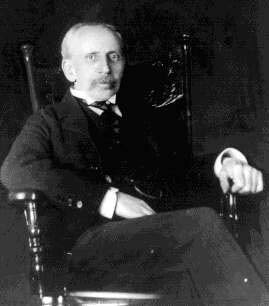 Adolph Sichel was the son of Hermann Sichel and Mathilde Neustadt of Sprendlingen, later Mainz. 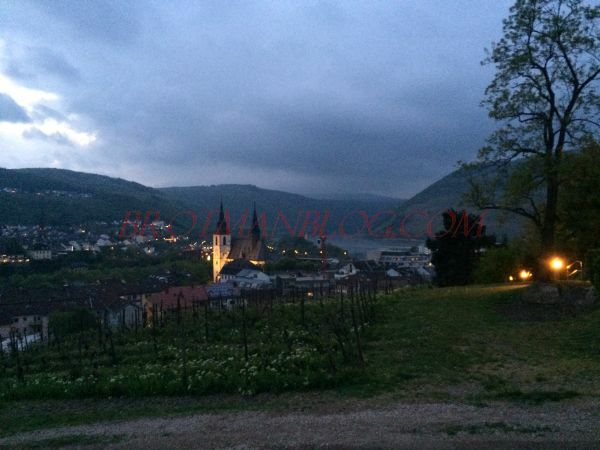 Hermann Sichel was the founder of the renowned wine producing and trading business, H. Sichel Sohne. 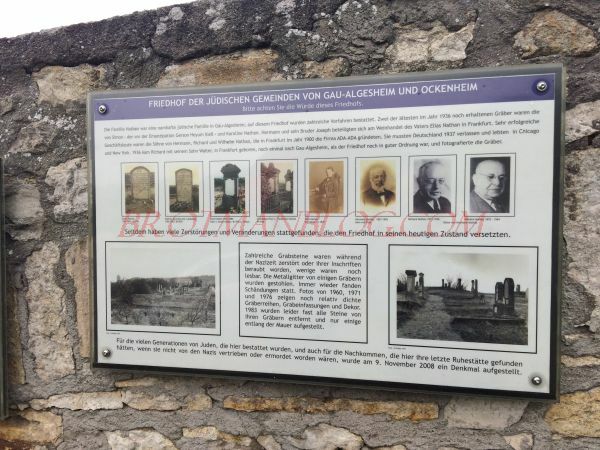 Although it is beyond the scope of my blog to delve too deeply into the story of the Sichel wine business, a little background helps to shed light on Adolph, Klara, and their descendants. 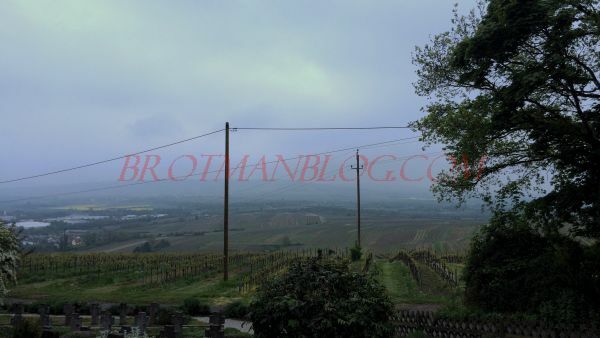 According to several sources, Hermann Sichel started the family wine business with his sons in 1856 in Mainz, Germany. Ancestry.com. 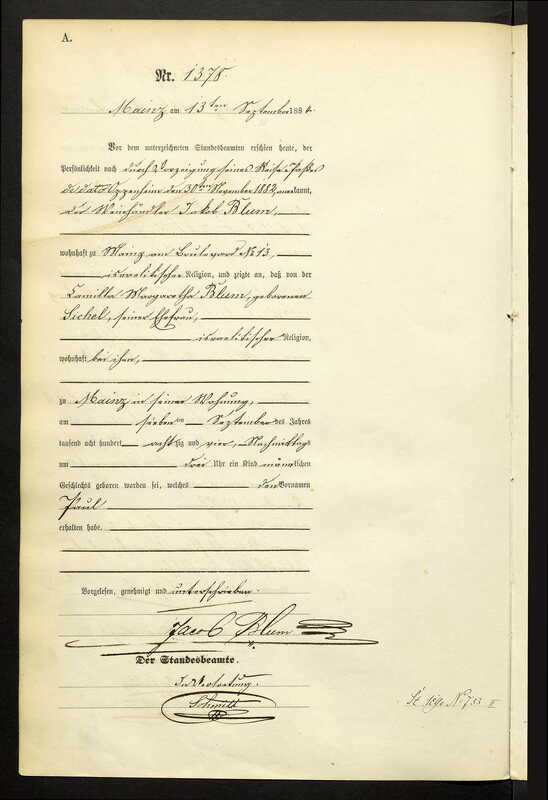 Mainz, Germany, Birth Records, 1872-1900 [database on-line]. Provo, UT, USA: Ancestry.com Operations, Inc., 2014. 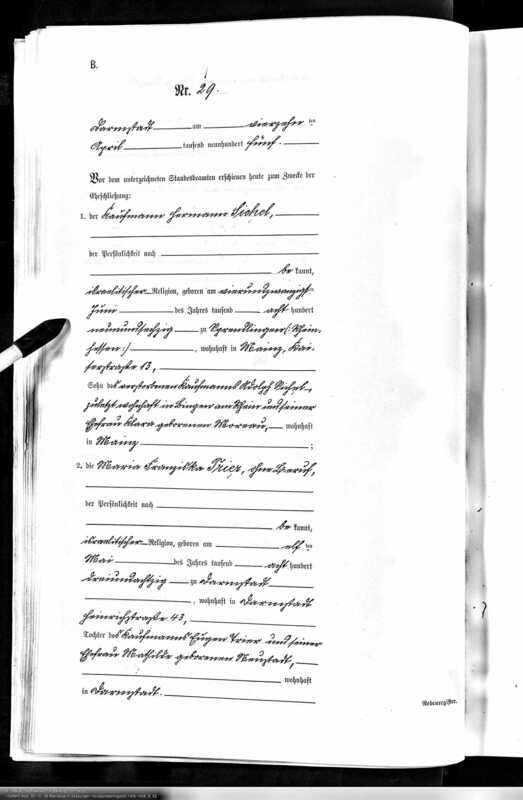 Original data: Personenstandsregister Geburtenregister 1876-1900. Digital images. 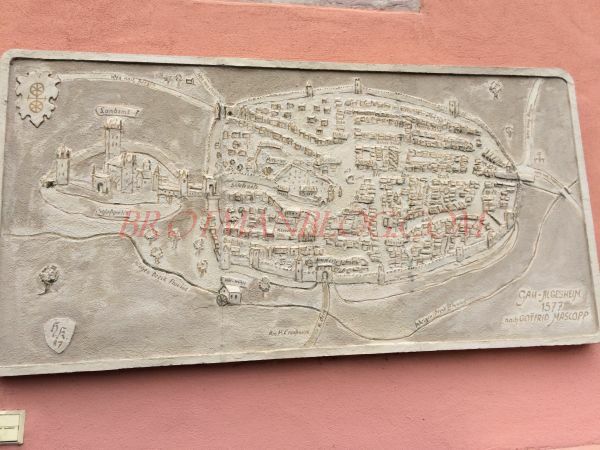 Stadtarchiv Mainz, Mainz, Germany. 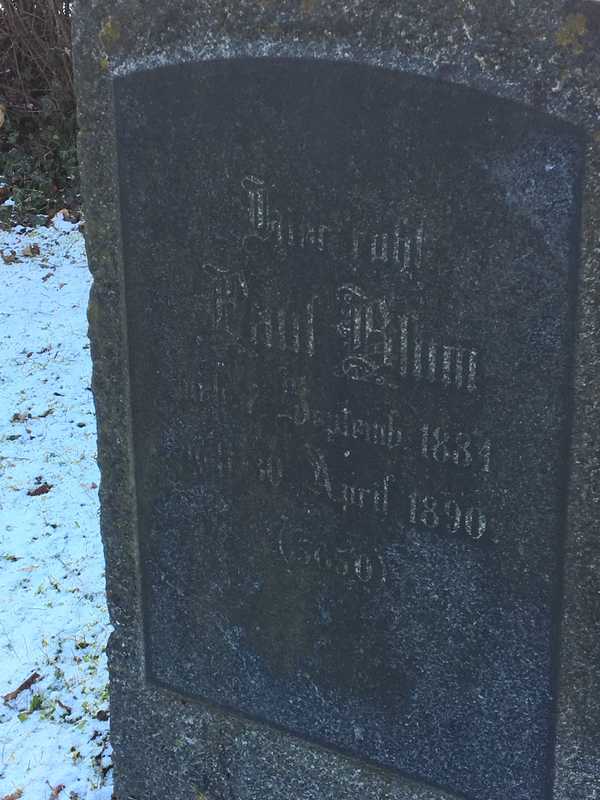 Paul died as a young boy in 1890 and is buried in the Jewish cemetery in Mainz. Ancestry.com. 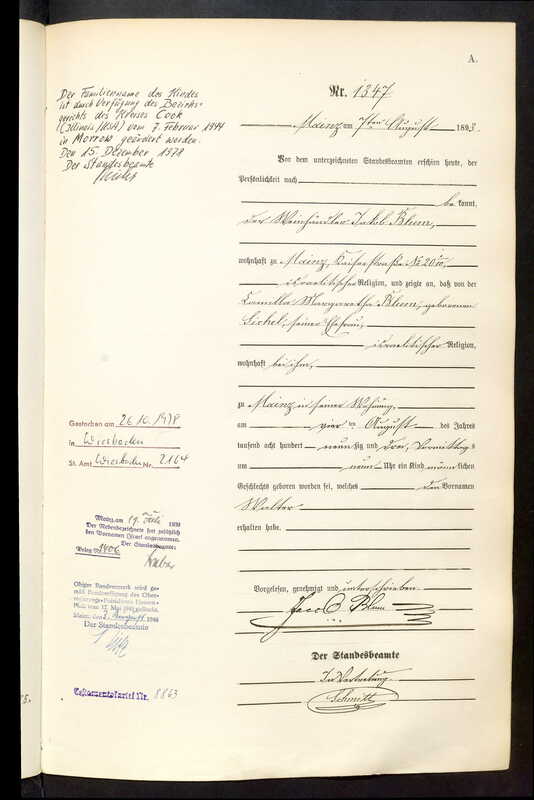 Mainz, Germany, Deaths, 1876-1950 [database on-line]. Lehi, UT, USA: Ancestry.com Operations, Inc., 2015. 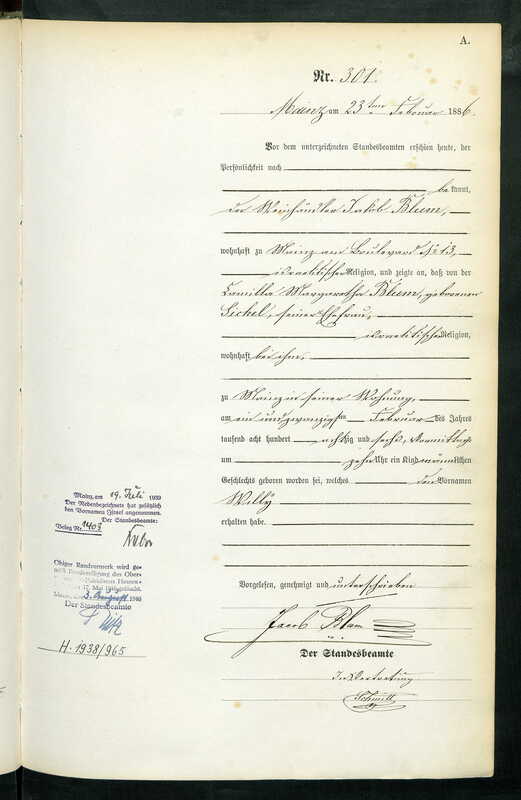 Original data: Personenstandsregister, Sterberegister, 1876-1950. 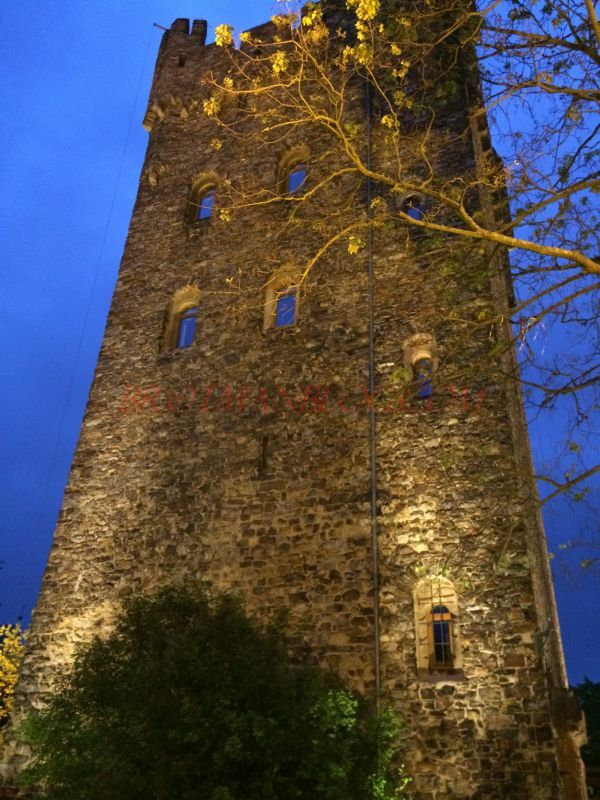 Mainz Stadtarchiv. His wife Camilla would survive him by almost thirrty years. 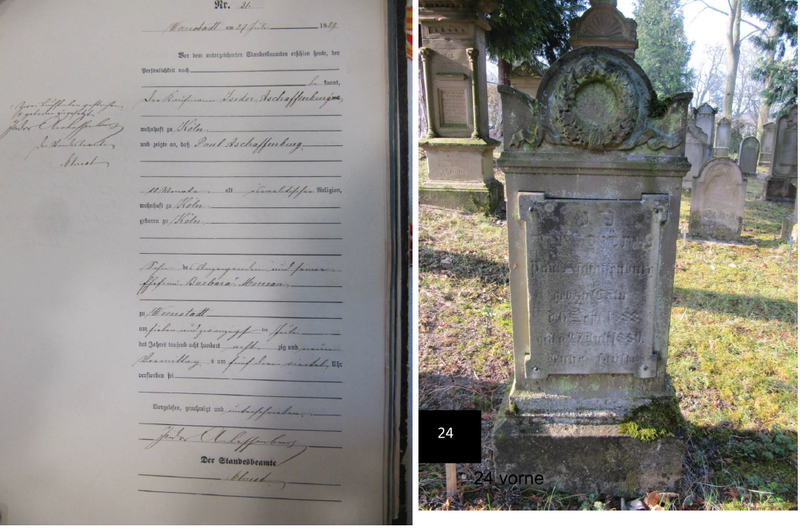 Hermann Sichel in Ancestry.com. 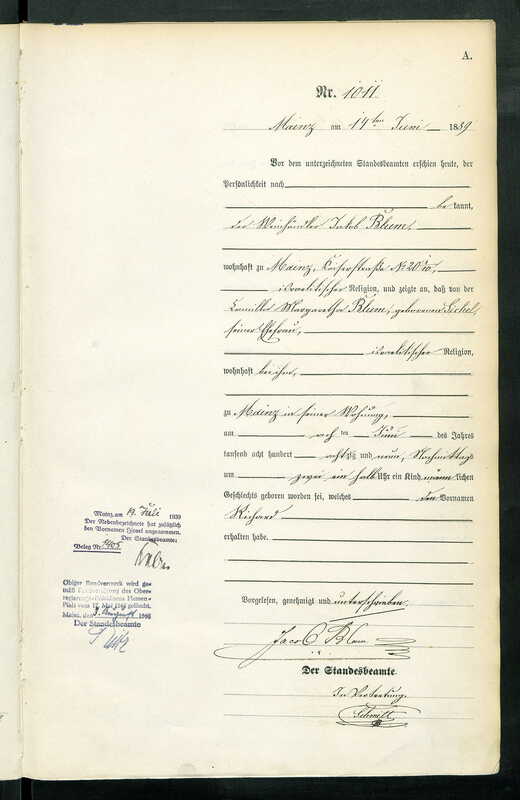 Germany, Index of Jews Whose German Nationality was Annulled by Nazi Regime, 1935-1944 [database on-line]. Provo, UT, USA: Ancestry.com Operations, Inc., 2011. 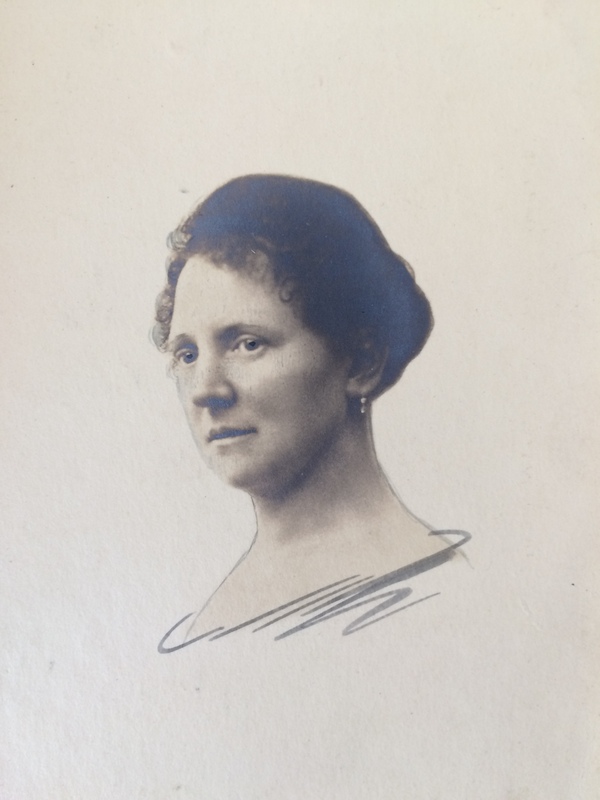 On April 14, 1905, Hermann married Maria Franziska Trier, who was born on May 11, 1883, in Darmstadt, Germany, to Eugen Trier and Mathilde Neustadt. 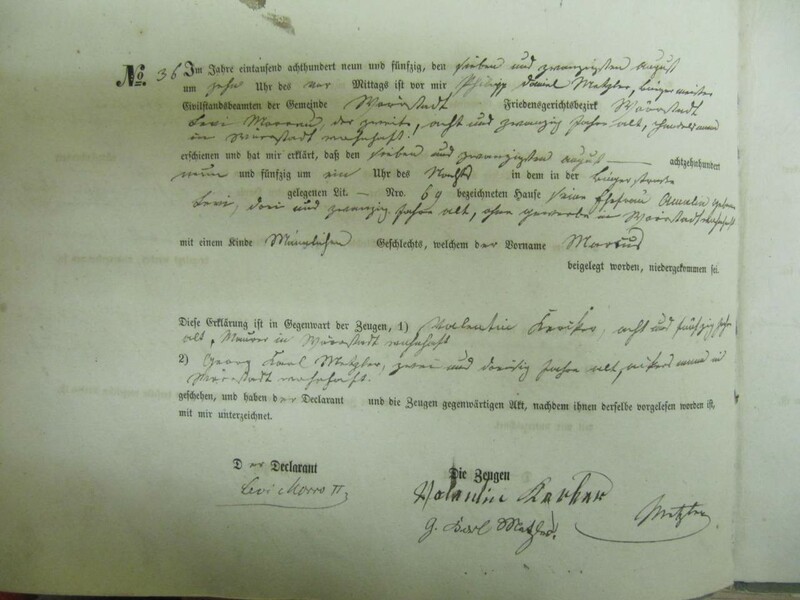 Maria was 21, and Hermann was 35. 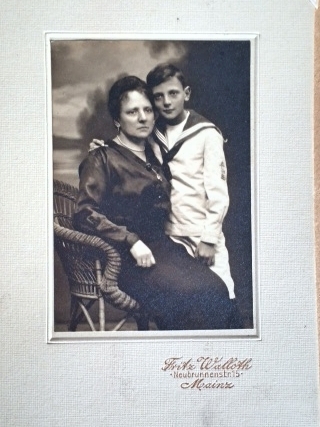 Hermann and Maria had two sons, Walter Adolph (1906) and Ernst Otto (1907). 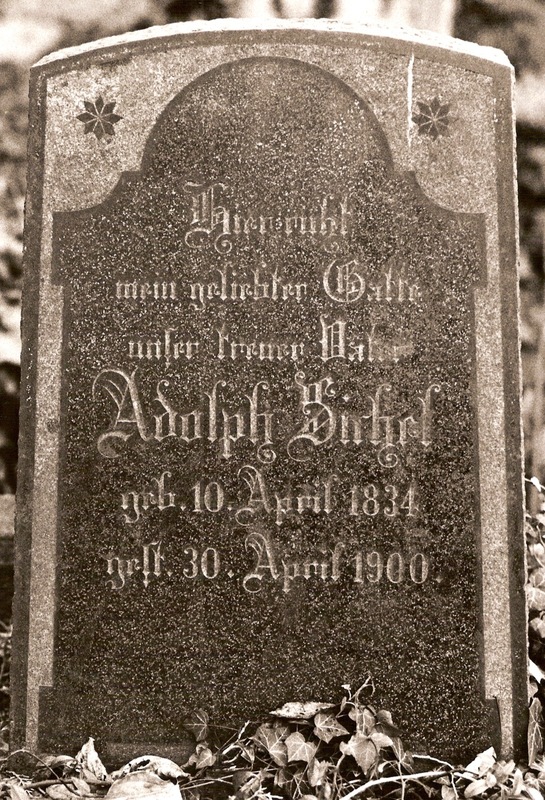 Camilla and Hermann’s father Adolph Sichel died on April 30, 1900, as seen above on his gravestone; Hermann’s older son Walter Adolph was obviously named at least in part for Adolph. 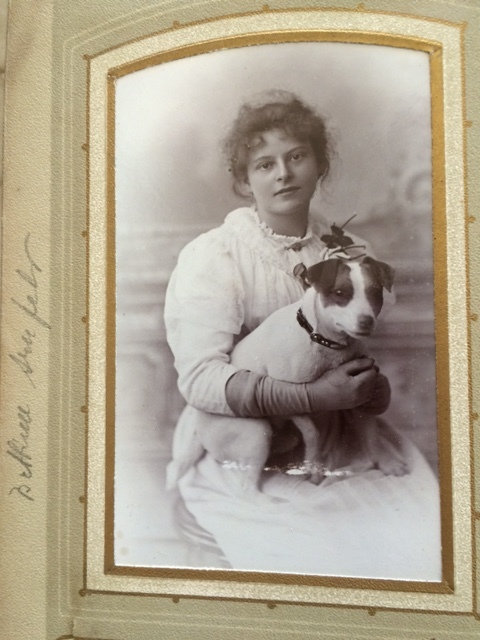 Klara Morreau Sichel died on April 2, 1919. 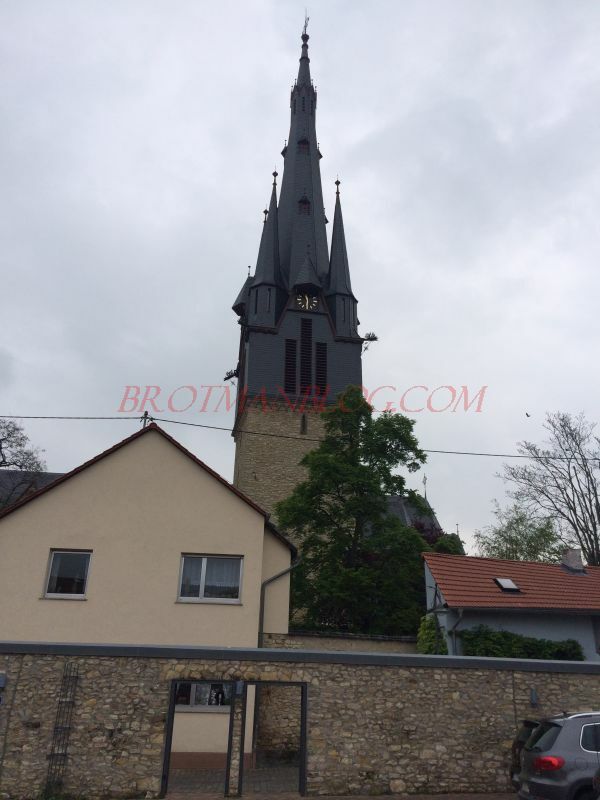 Adolph and Klara are buried in Bingen. 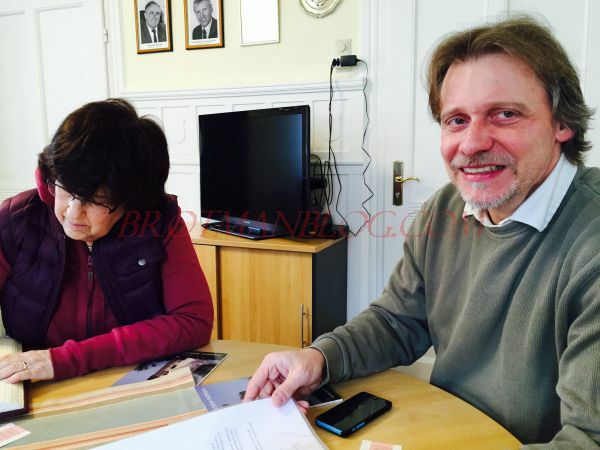 The families of both Camilla Sichel Blum and Hermann Sichel remained in Germany until after Hitler came to power in 1933. Then they all left for either England or the United States. Two of Camilla’s sons, Richard and Walter, ended up in the US. 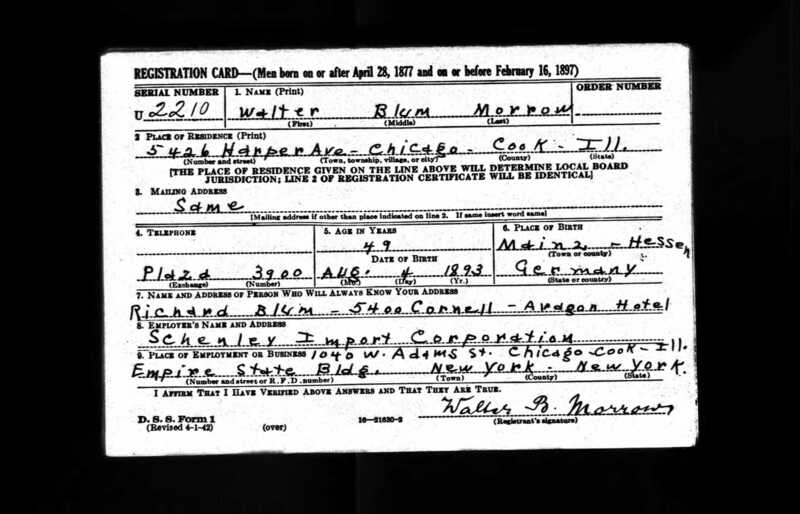 Walter arrived first—on April 27, 1939. Ancestry.com. 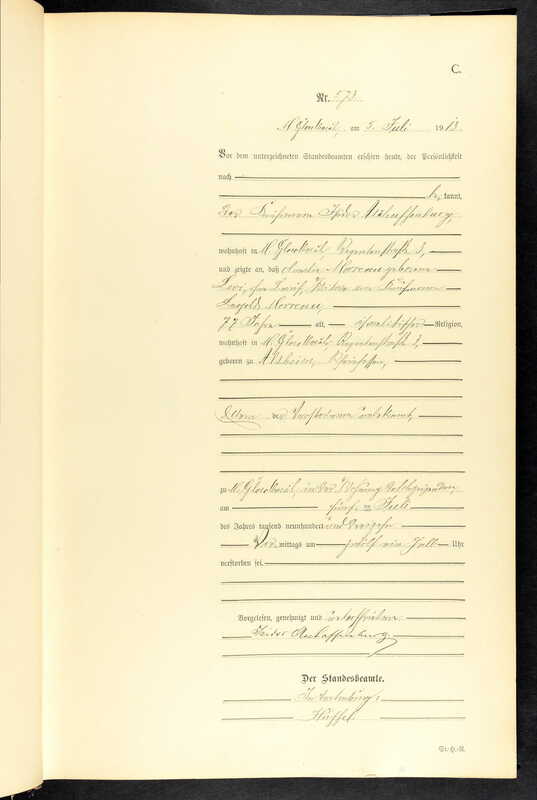 New York, Passenger Lists, 1820-1957 [database on-line]. Ancestry.com. 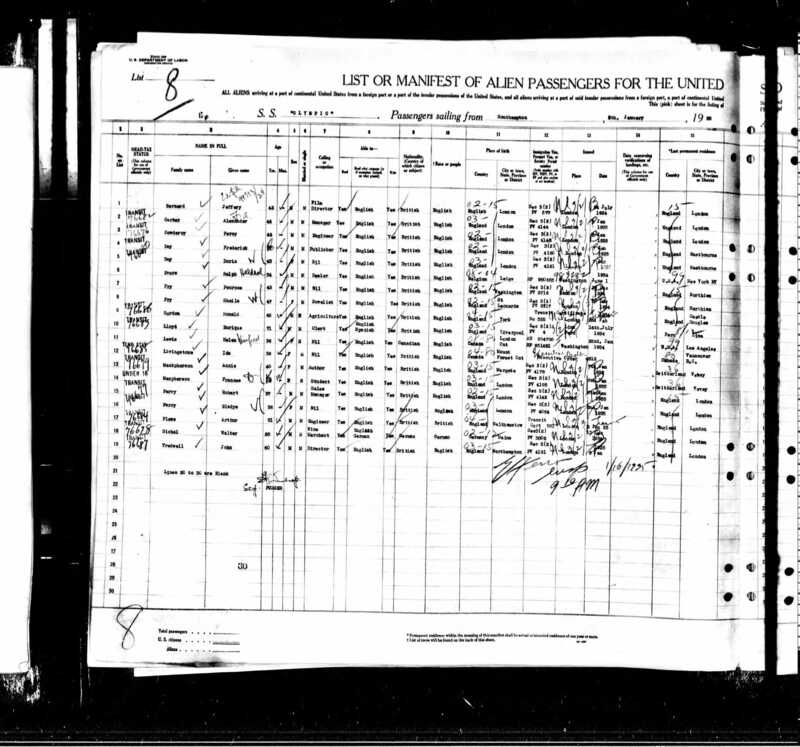 New Orleans, Passenger Lists, 1813-1963 [database on-line]. Provo, UT, USA: Ancestry.com Operations, Inc., 2006. Original data: Selected Passenger and Crew Lists and Manifests. National Archives, Washington, D.C.View all sources. Original data: Passenger Lists of Vessels Arriving at New York, New York, 1820-1897. 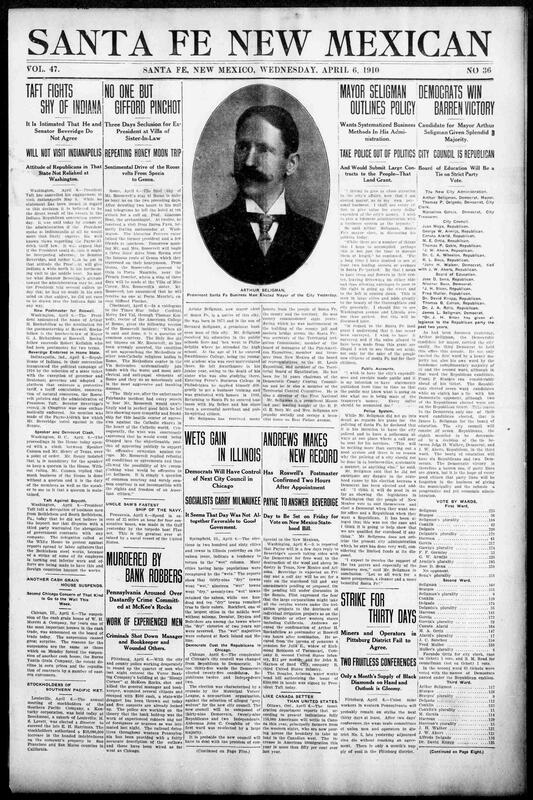 Microfilm Publication M237, 675 rolls. 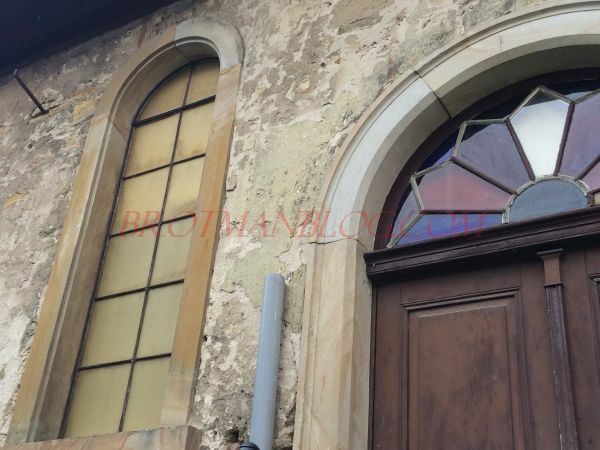 NAI: 6256867. 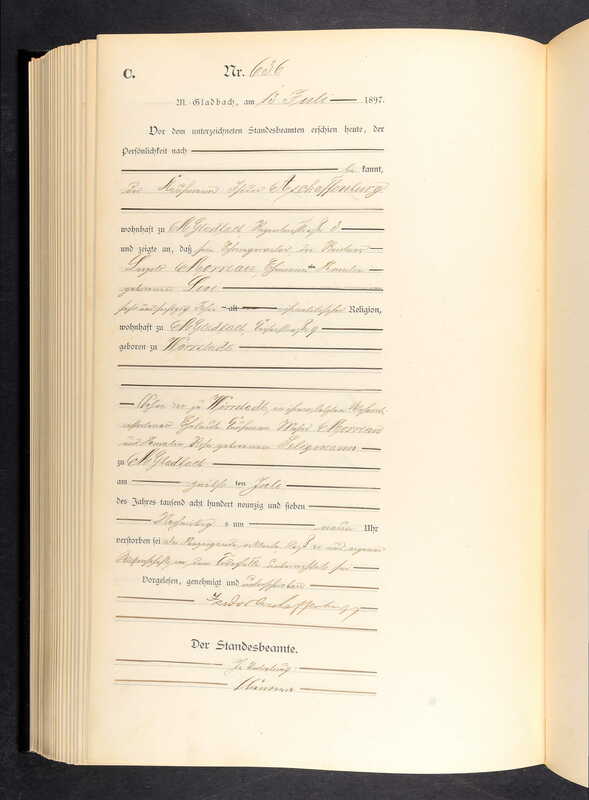 Records of the U.S. Customs Service, Record Group 36. National Archives at Washington, D.C. 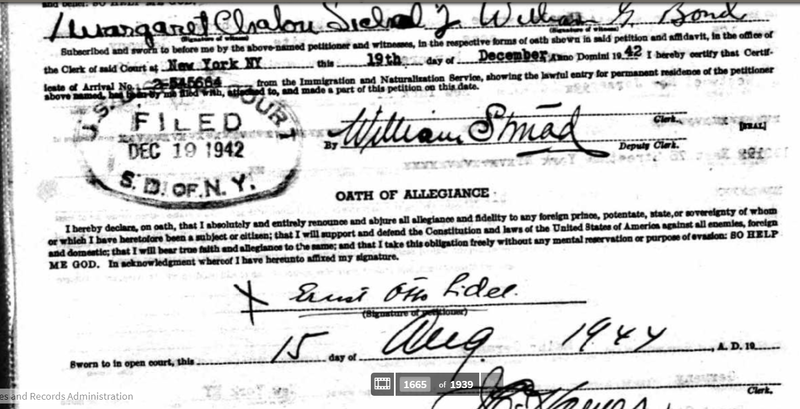 Both brothers registered for the World War II draft in 1942. Richard was now living at the Hotel Aragon in Chicago and working for Geeting & Fromm, a Chicago wine importing business. 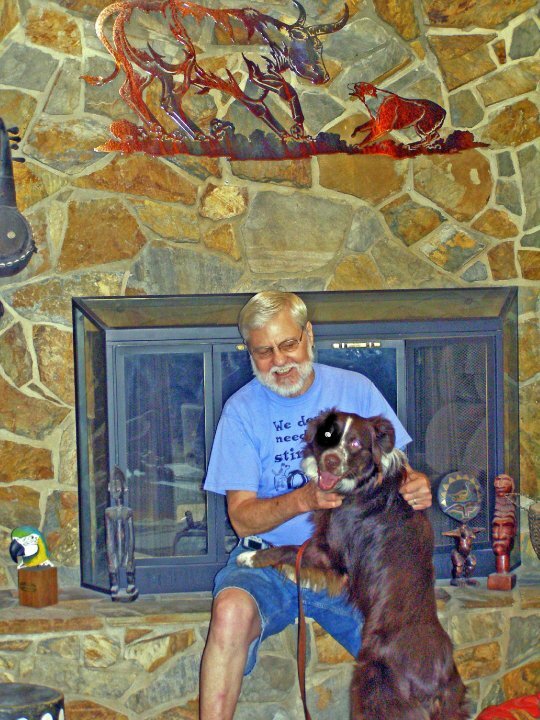 Walter was still living at the Harper-Surf Hotel and working for Schenley Import Corporation, a liquor importing business. 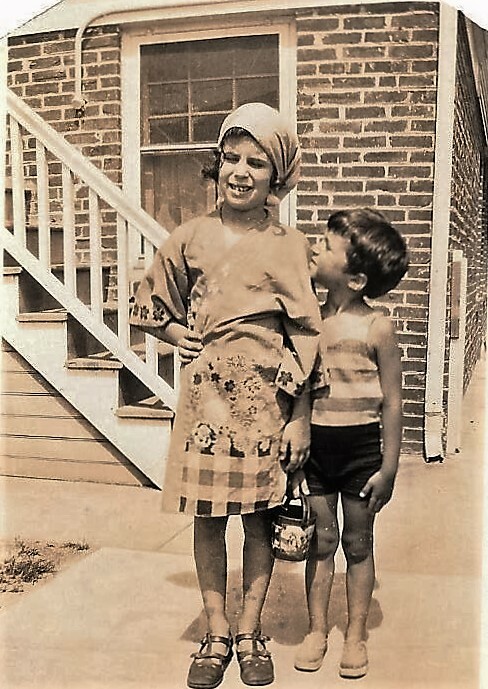 Both brothers also became naturalized citizens of the United States in 1944. 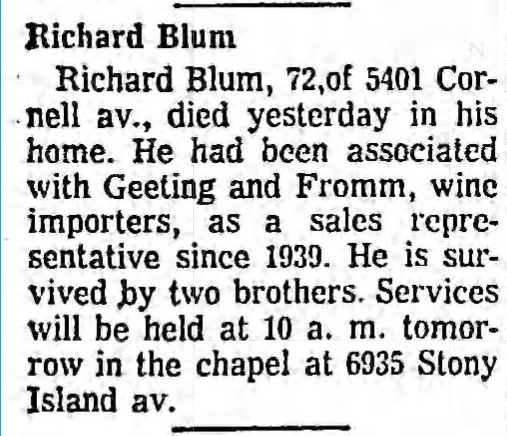 Richard died in 1961; his death notice reported that he was still a sales representative for Getting & Fromm at the time of his death. 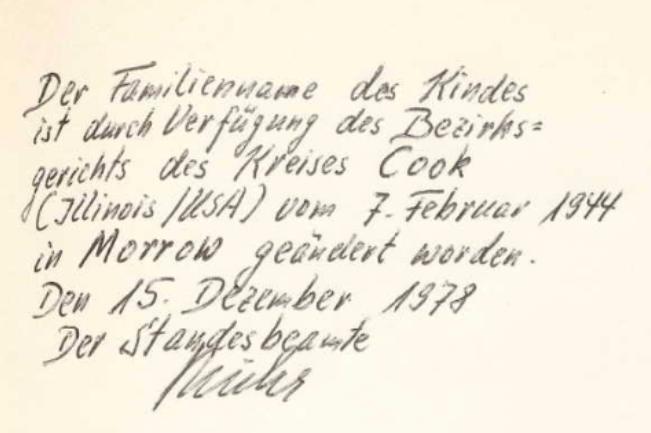 Walter died on October 26, 1978, in Wiesbaden, German, according to a notation on his birth record; interestingly, he apparently had returned to live in Germany, as the US Social Security Death Index reported his last residence as Frankfurt, Germany. Meanwhile, their older brother Willy, known as Wilhlem and then William, had immigrated to England. 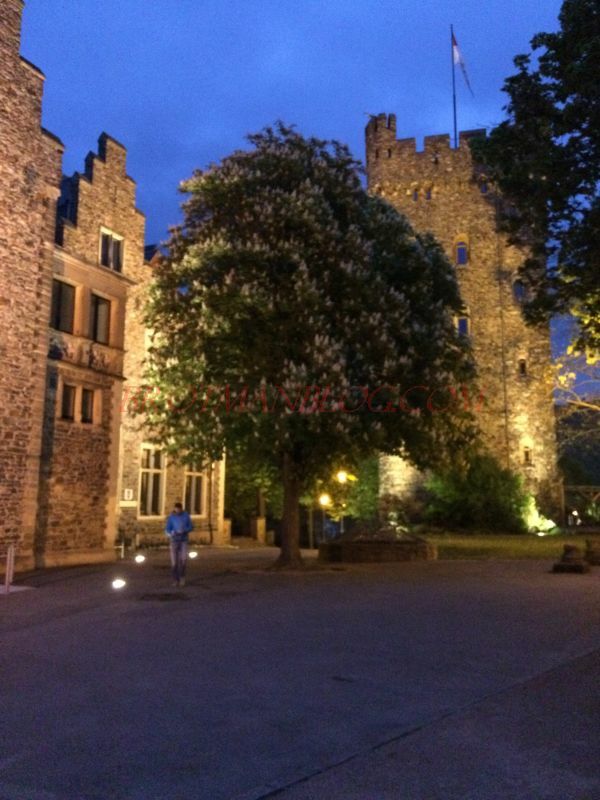 Although I don’t have any records showing when William left Germany, I believe that he must have been living in England before 1943, as his mother Camilla Sichel Blum died in York, England, in 1943 (England & Wales, Death Index, 1916-2006). William is listed as living in York on a 1956 UK passenger ship manifest for a ship departing from New York and sailing to Southampton, England. I assume that Camilla had been living in York with her oldest son, William, at the time of her death in 1943. 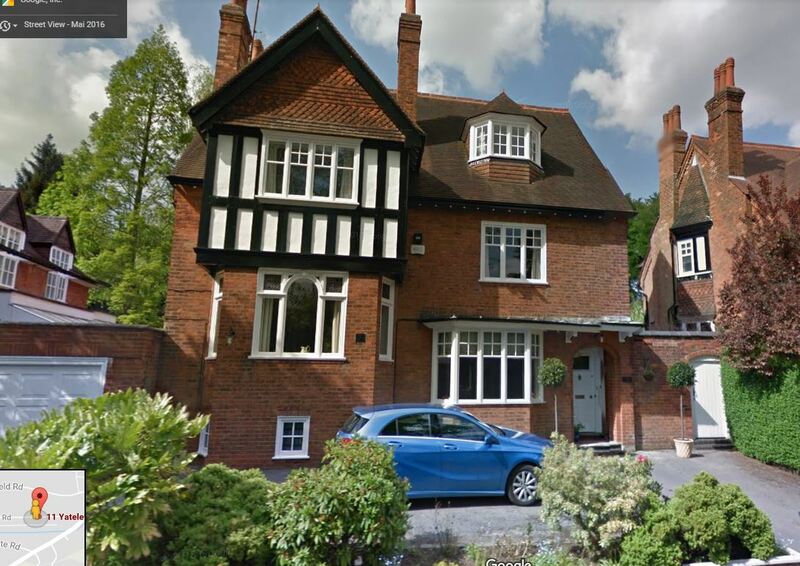 That 1956 manifest reports that William was married, a wine merchant, living at 13 Maple Grove, Fulford Road, York, England, and a citizen and permanent resident of England. 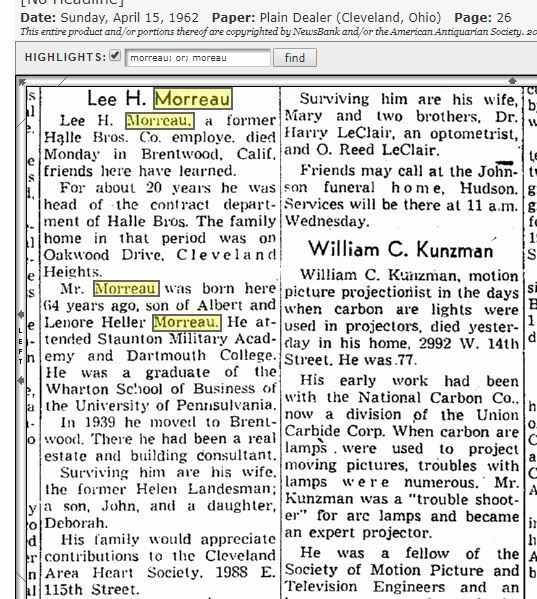 I also found him listed in several phone books at the same address from 1958 until 1964. Aside from that I have no records of his whereabouts or his family or his death. I don’t know whether he was involved in the Sichel wine business or a different wine company. I also don’t know whether he was married or had children. I have contacted the York library and have requested a search of the newspapers and other records there, so hope to have an update soon. 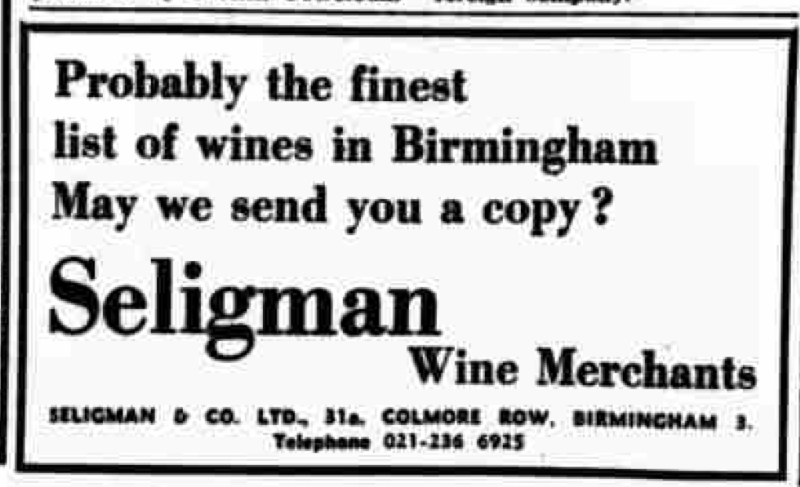 Anti-German feeling still lingered when young Sichel came to Britain in 1928 and travelled the country with his case of sample bottles from the family firm, H. Sichel Sohne of Mainz. Youthful persistence apart, he was lucky to have with him some of “the vintage of the century,” 1921. Potential customers found his wines easy to like, but impossible to pronounce. 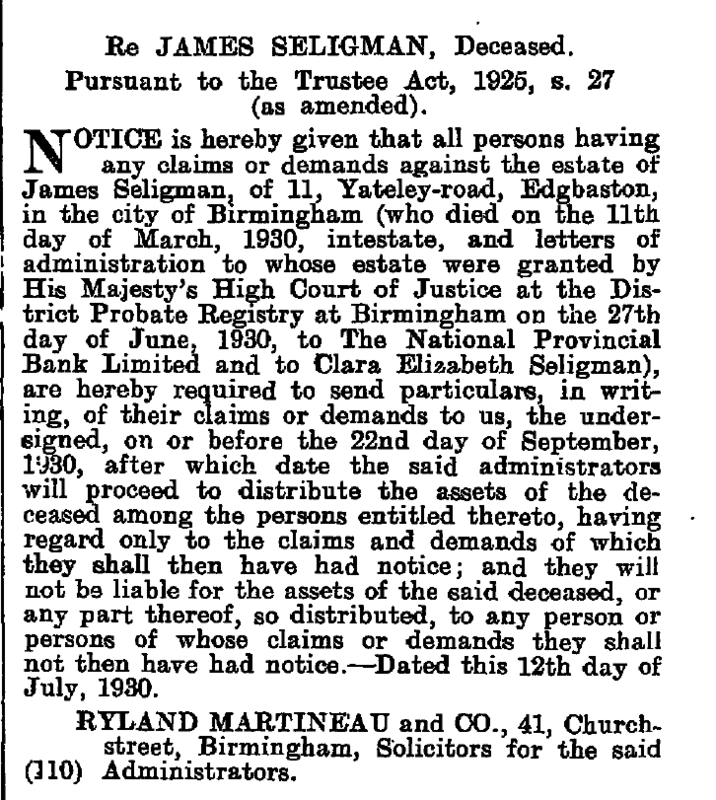 Walter had moved permanently to England by 1935, as he is listed in the London Electoral Register for that year; also, he gave a London address on a ship manifest dated January 16, 1935. 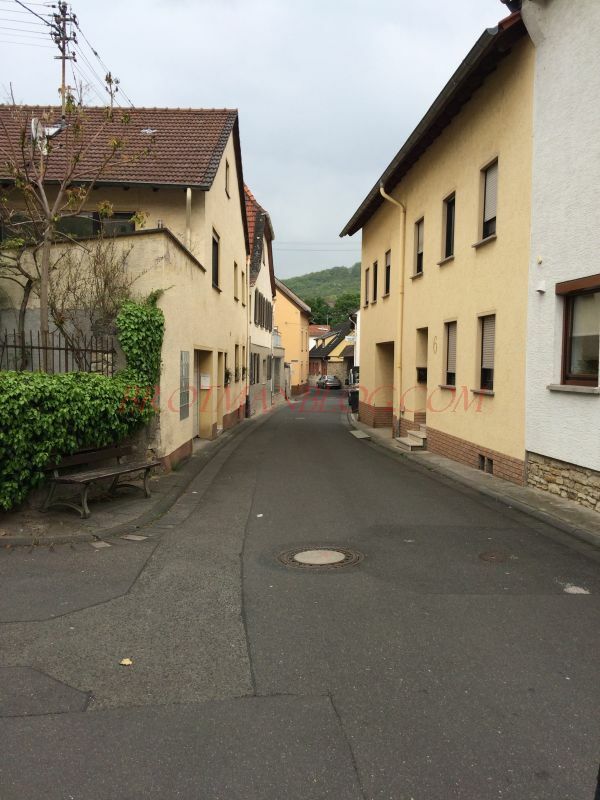 Walter Sichel’s younger brother, Ernst Otto Sichel (generally known as Otto), immigrated to the US.. 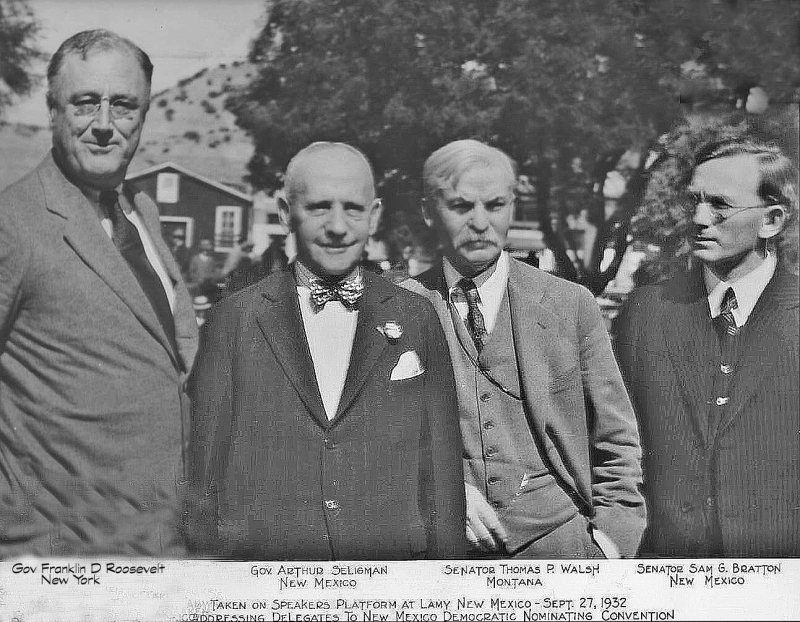 He first arrived for a four month visit in October 1936, entering the country in Buffalo; he listed agents of the Taylor Company as those he was coming to see, so I assume this was a business trip with the Taylor Wine Company in upstate New York. 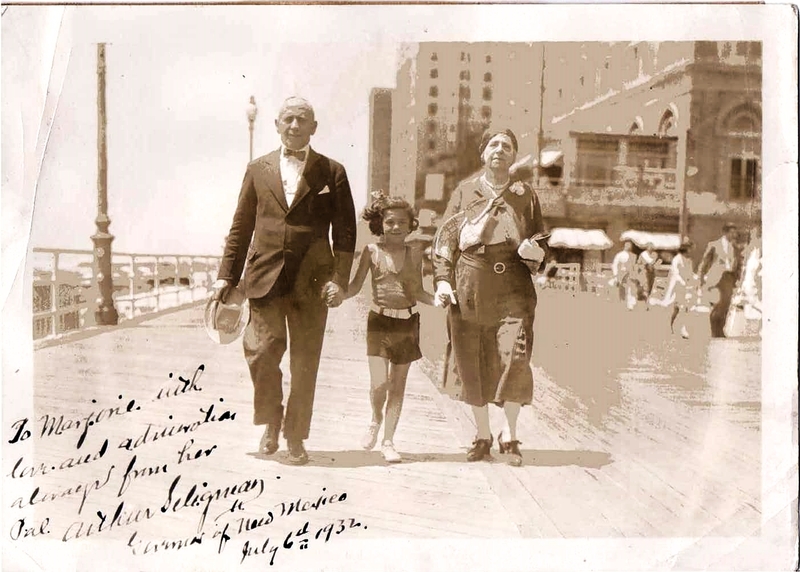 But Otto returned to settle permanently in the US on September 30, 1937. 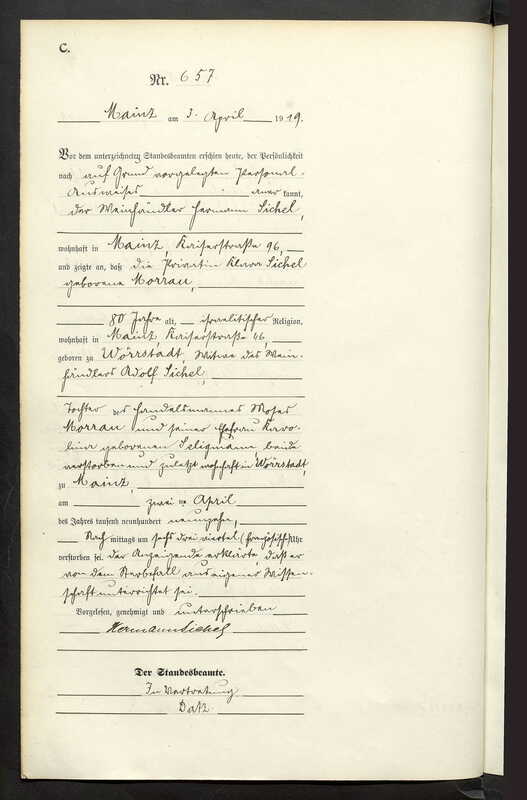 By May 1938, Hermann Sichel and Maria Trier, Otto and Walter Sichel’s parents, had also left Germany as they listed themselves as residing in London on a ship manifest when they traveled to New York on that date. 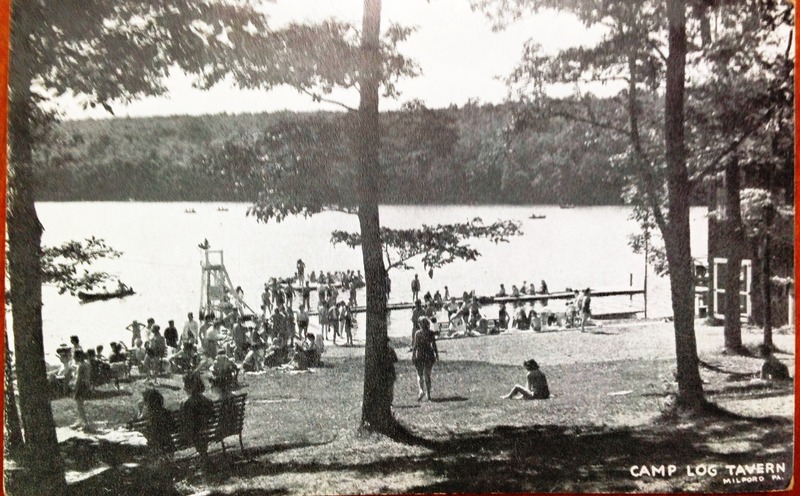 In August 1939, Otto listed them on a ship manifest as residing in Buckinghamshire, England, when he sailed from New York to England at that time. 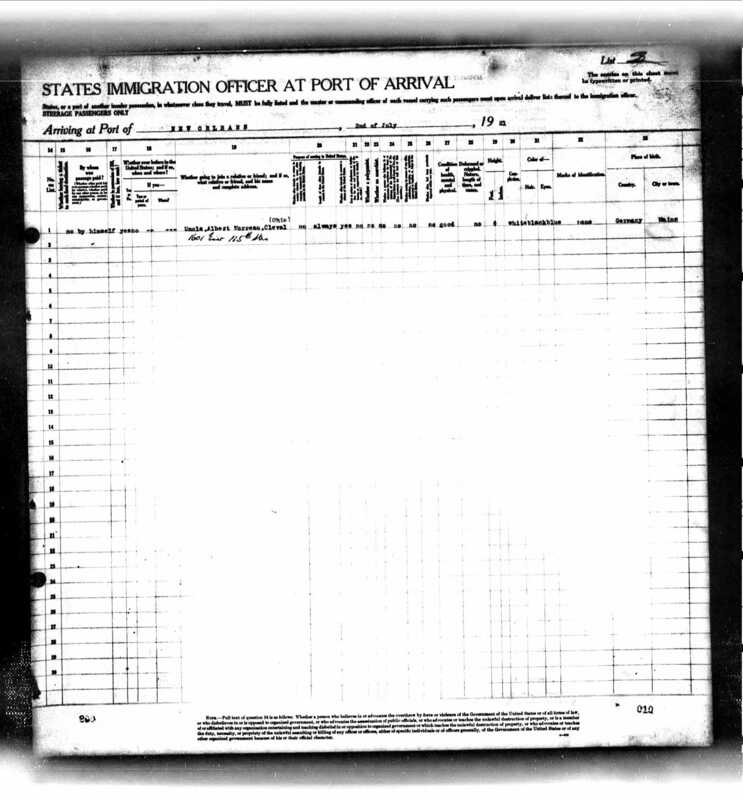 Original data: Board of Trade: Commercial and Statistical Department and successors: Outwards Passenger Lists. BT27. 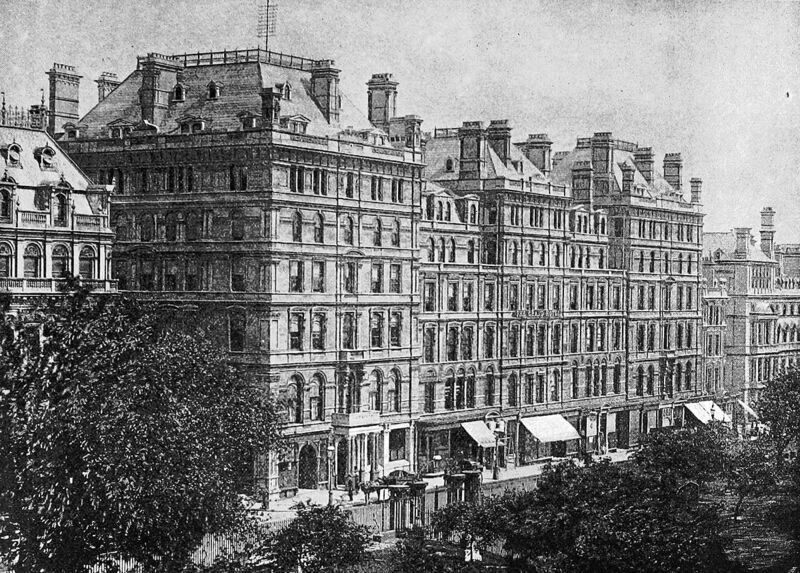 Records of the Commercial, Companies, Labour, Railways and Statistics Departments. 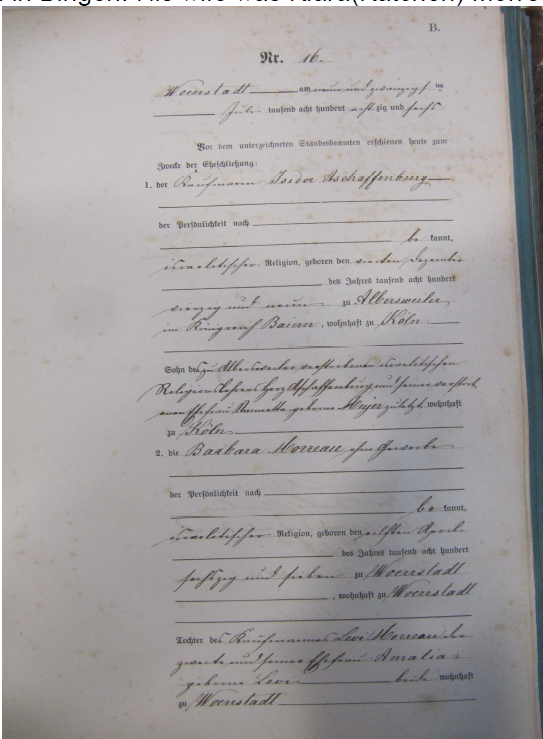 Records of the Board of Trade and of successor and related bodies. The National Archives, Kew, Richmond, Surrey, England. 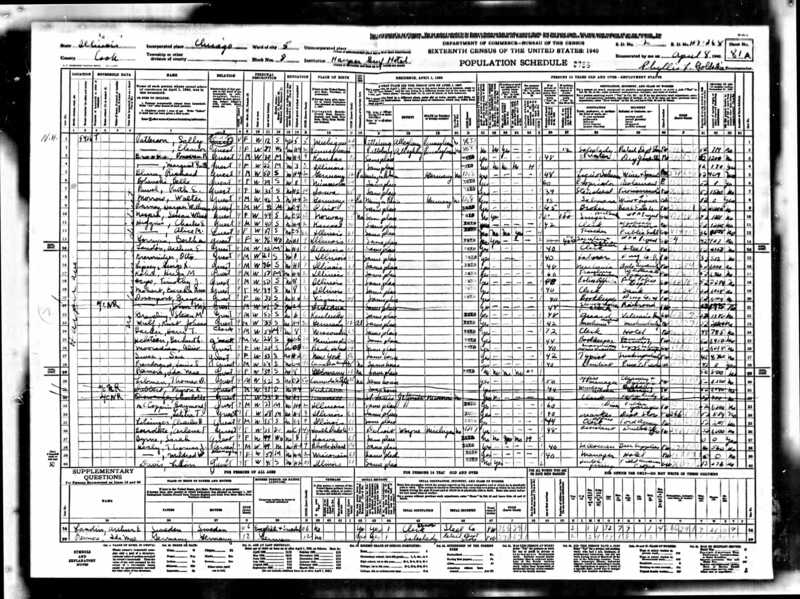 In 1940, their son Otto was listed on the US census as a paying guest in a home on East 84th Street in New York City. 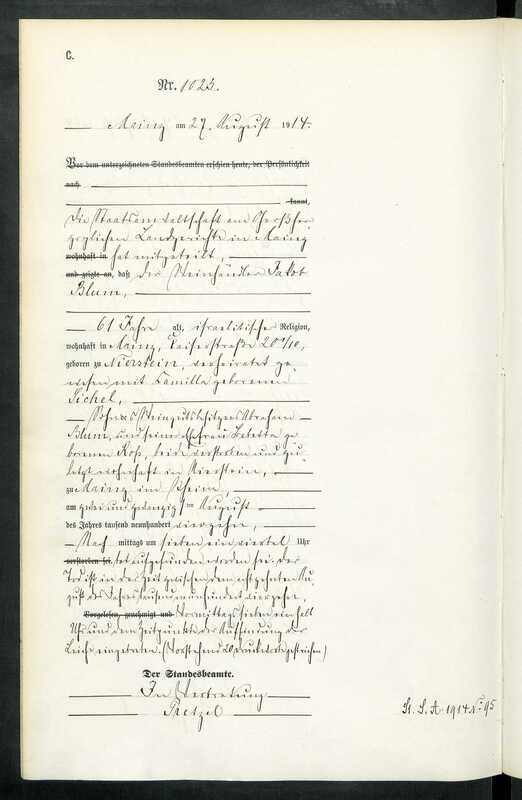 There was a notation on his entry that I’ve never seen before: “No response to this after many calls.” Was Otto avoiding the enumerator? Or was he just away on business? 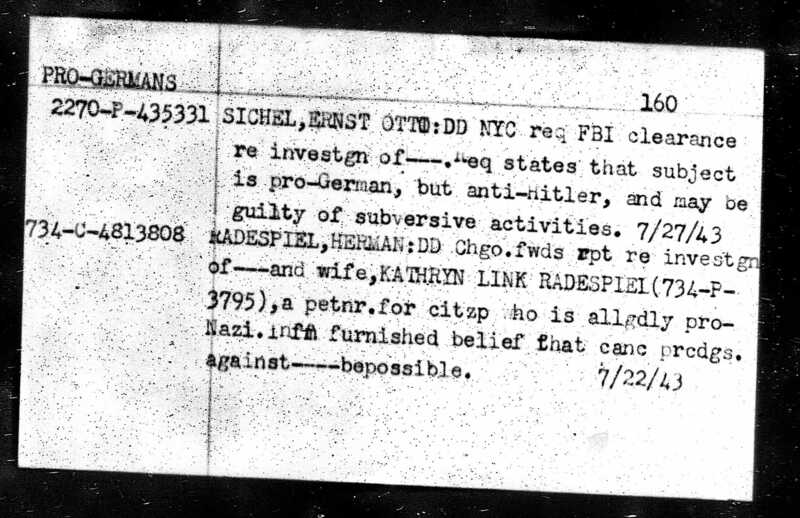 Perhaps this seeming evasiveness created some suspicion about Otto because in 1943 a request was sent by the US Immigration and Naturalization Service to the FBI to request clearance for Otto because he was “pro-German but anti-Hitler, and may be guilty of subversive activity.” I consider myself pro-American even when I do not like my country’s leaders or actions at certain times; I assume that that was how Otto felt—affection for the country of his birth, but opposed to its actions under the Nazis. On January 3, 1942, Otto married Margarete Frances Chalon in Westwood, New Jersey; Margarete was born in New York in 1919; she was 22 when they married, and Otto was 34. 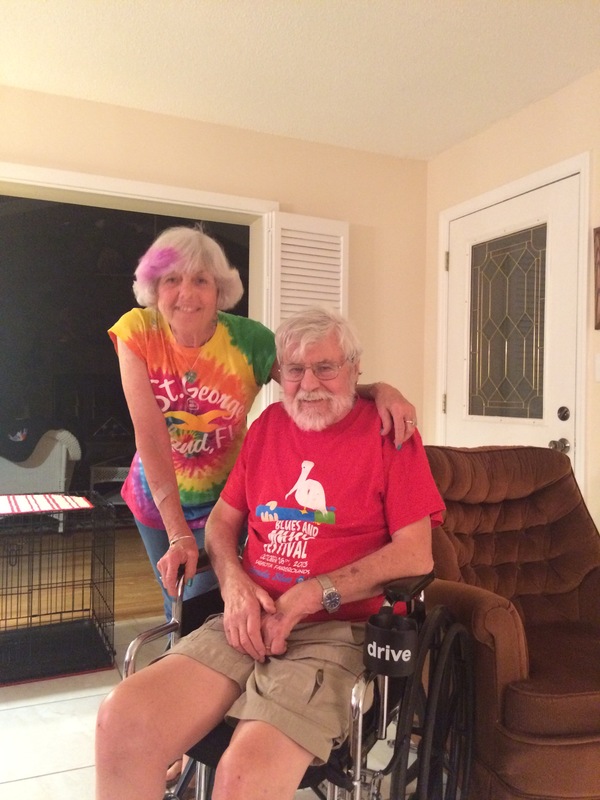 The marriage did not last, and they were divorced in Florida in 1949. 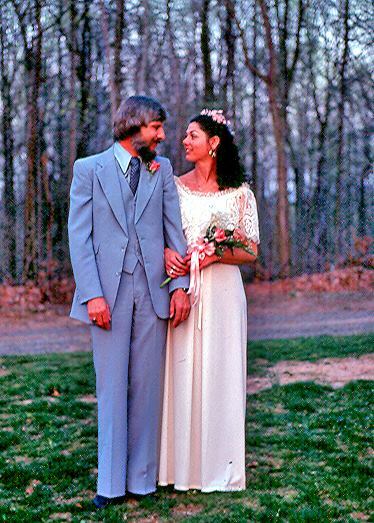 The following year Otto married again; his second wife was Anne Marie Mayer. 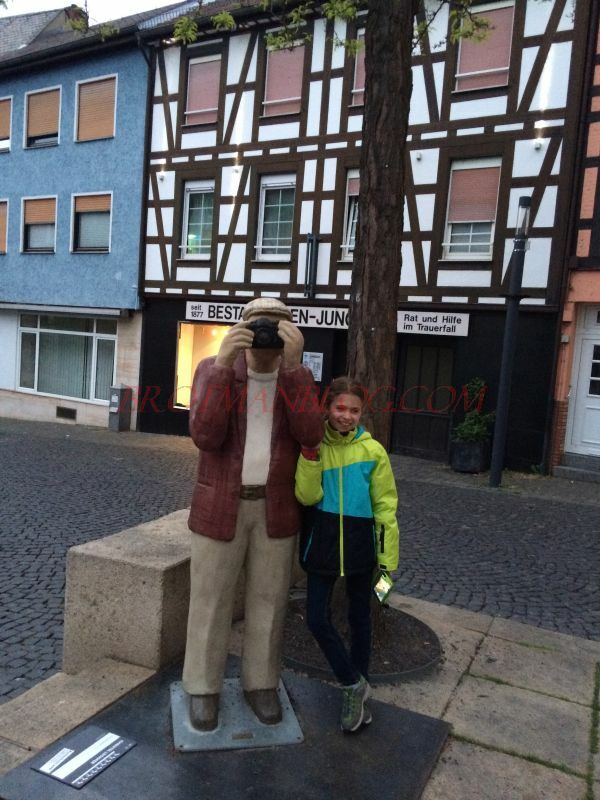 She was born in Germany in 1921. 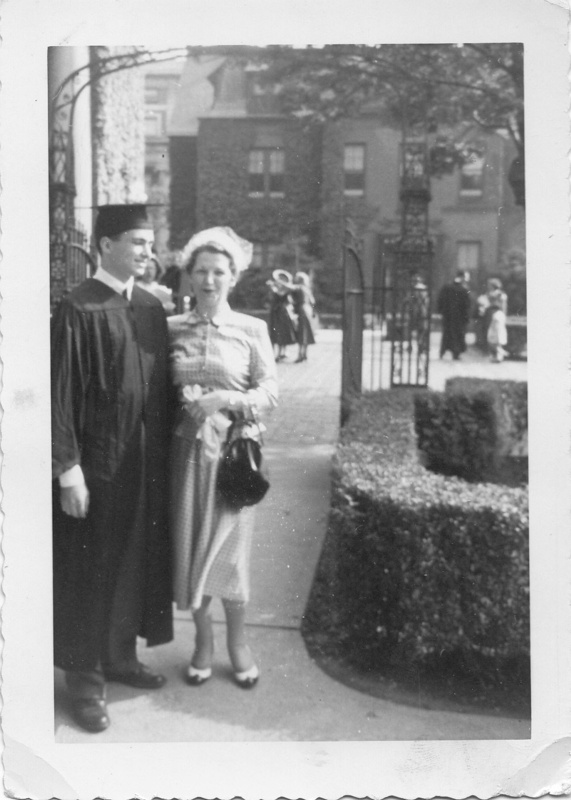 Otto and Anne Marie eventually moved to Port Washington, New York. Otto died on May 10, 1972, in San Francisco. He was 65 years old. 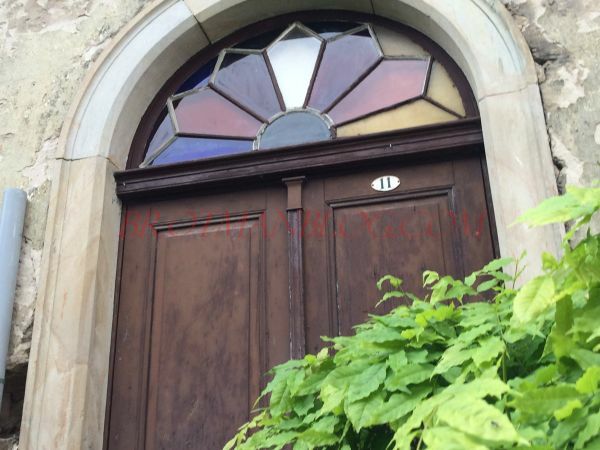 According to his obituary, he was the vice-president of Fromm & Sichel, a subsidiary of Jos. 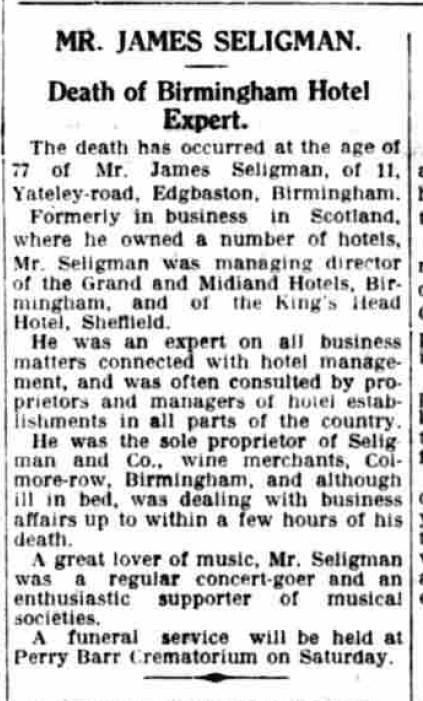 E. Seagram & Sons, at the time of his death and had been working for that company for twenty years. “E. Otto Sichel Dies; Wine Expert Was 65,” The New York Times, May 13, 1972 (p. 34). 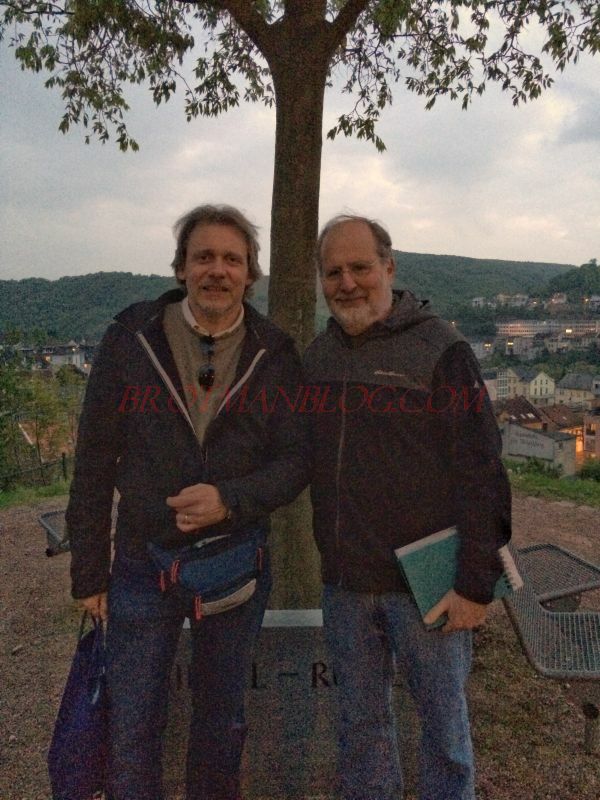 Without going into the full corporate history, there are obvious links here between the various Sichel/Blum cousins—Richard Blum worked for the Chicago wine distributor Geeting & Fromm, which was founded in part by Paul Fromm, whose brother Alfred Fromm and Franz Sichel, first cousin of Walter Sichel and Richard Blum, founded the company where Walter Sichel worked, the San Francisco wine distributor Fromm & Sichel . Who was this friend Isaac Heller? He was the brother of Leanora Heller Morreau. Yes, the Leanora I had researched back in 2014 to try and understand why she had tried to rescue Bettina Seligmann Arnfeld from Nazi Germany. 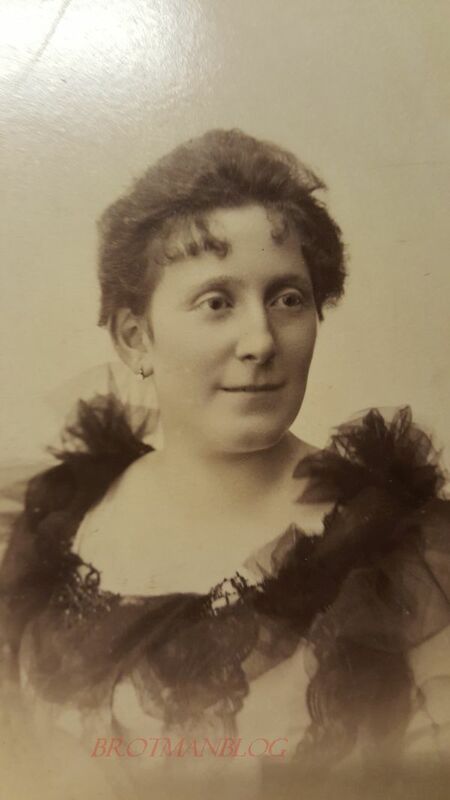 The same Leanora whose husband Albert was the grandson of Caroline Seligmann Morreau and a first cousin of Camilla Sichel Blum, Walter’s mother, and Hermann Sichel, Otto’s father. 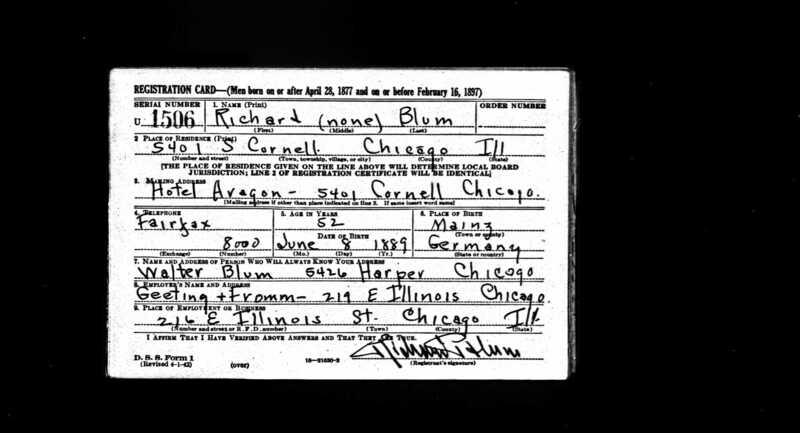 Leanora may not have been able to help her late husband’s cousin Bettina Seligmann Arnfeld, but obviously she and her brother Isaac were able to help Albert’s cousins Walter Blum and Otto Sichel. 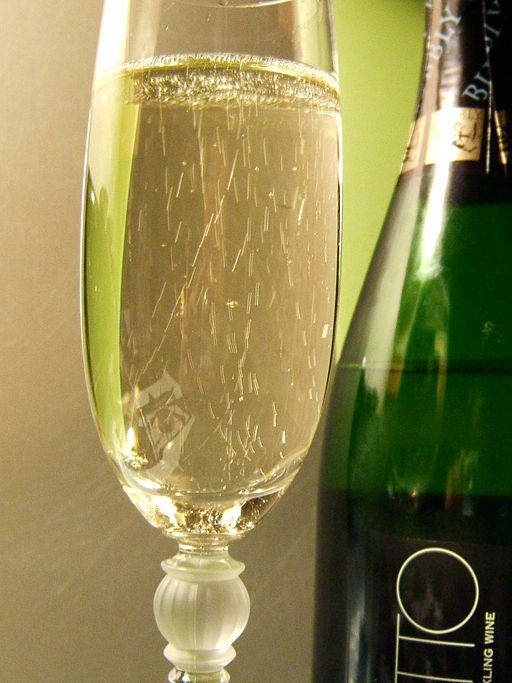 And so I lift a glass of wine (not Blue Nun, preferably a prosecco) to toast Leanora Heller Morreau! L’chaim! 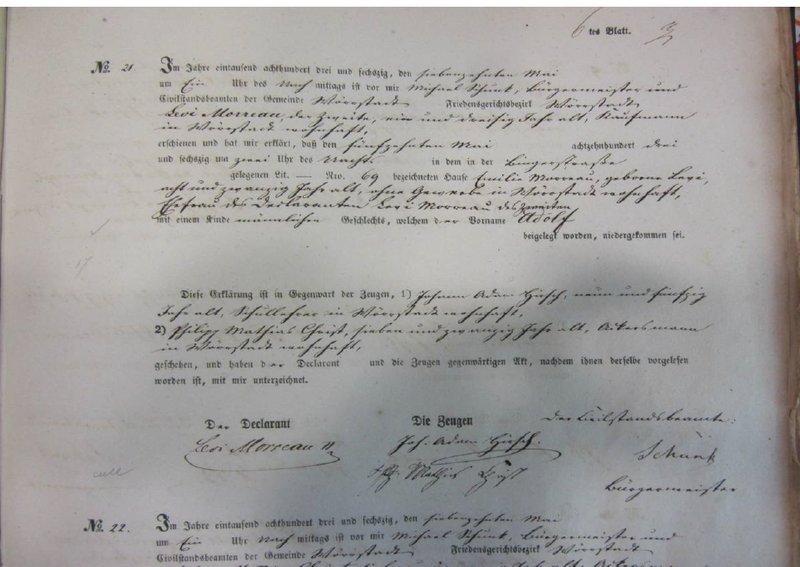 Unfortunately, the online records for Sprendlingen do not cover the years before 1870, and although there are some death records for the 1900s, the year 1900 is not included. 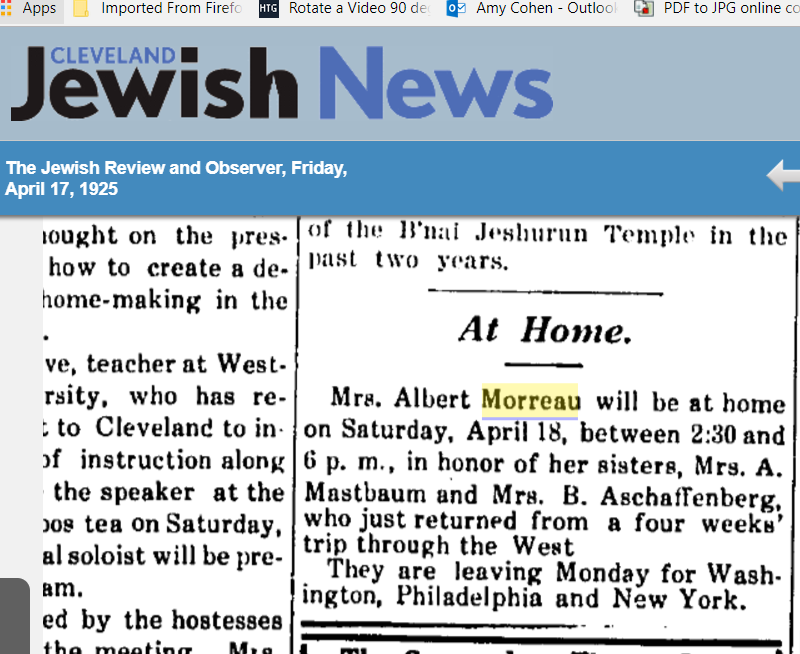 Another Mystery Solved: Who was “Leonara Morreau”? 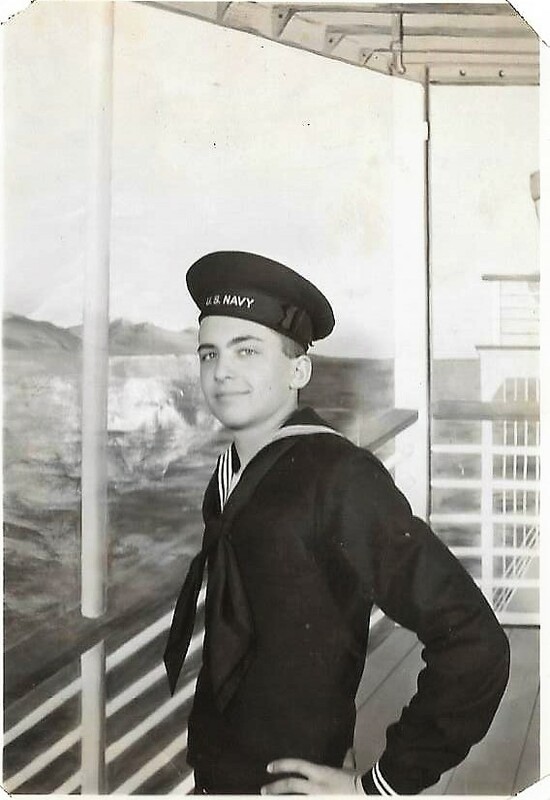 It still amazes me that people find my blog, leave a comment, and then lead me to answers to questions about my family’s history. Just a month ago someone named Shyanne left a comment that led me to answers to another question I had been unable to resolve several years ago. 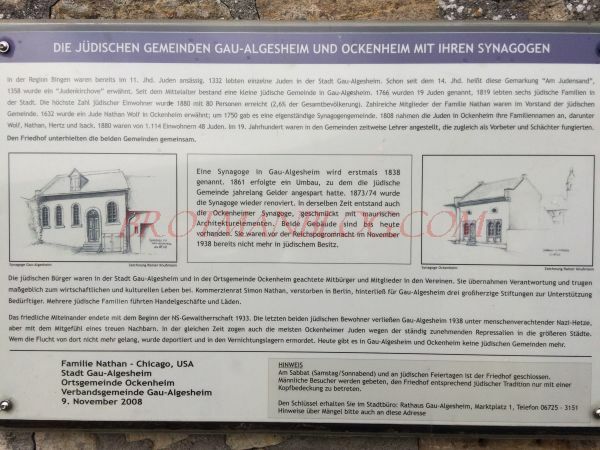 First, some background: Back in November 2014, I posted about a book I had received from Bernie Brettschneider of Gau-Algesheim, Die Geschichte der Gau-Algesheimer Juden by Ludwig Hellriegel (1986, revised 2008)[The History of the Jews of Gau-Algesheim]. 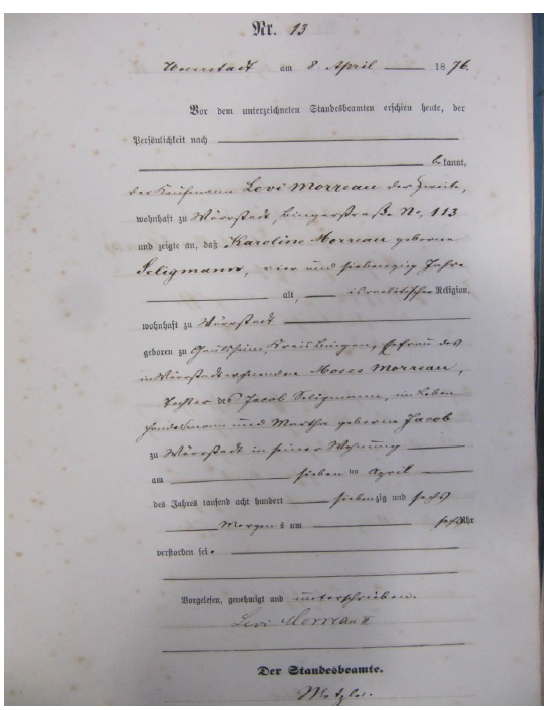 It was my first source of detailed information about my Seligmann relatives, and I had struggled to translate as much as I can. 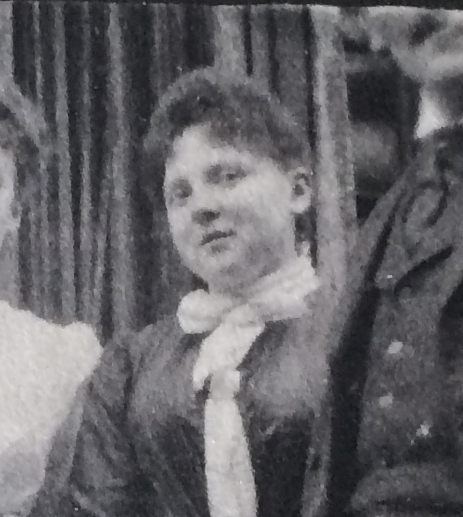 There is also an entry for Elizabeth nee Seligman Arnfeld, who was born March 17, 1875. 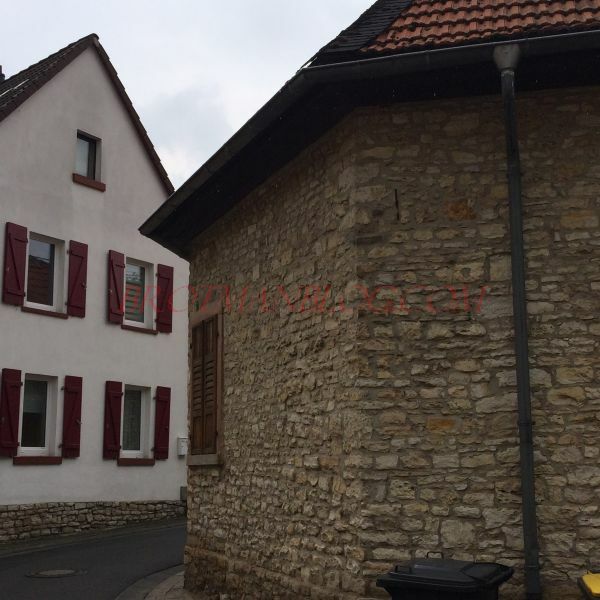 She had moved to Mulheim on the Ruhr in 1938 and wanted to emigrate to the United States. 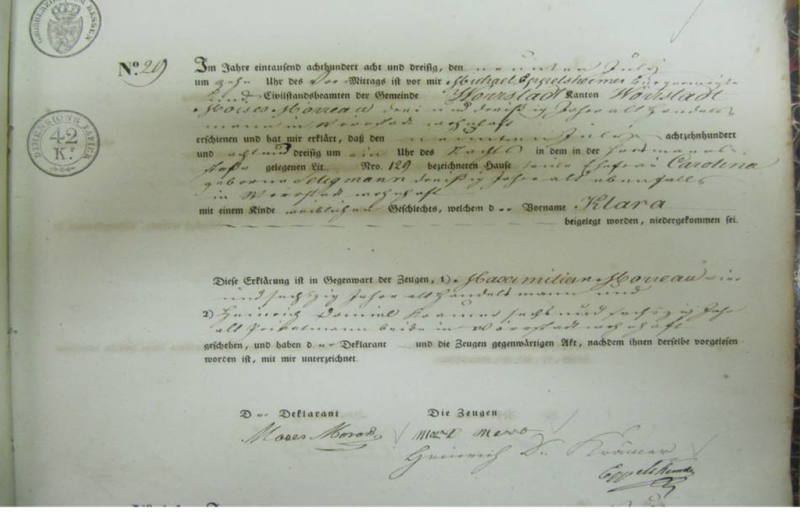 A woman named Leonara Morreau had vouched for them, but for unknown reasons they were never able to emigrate. 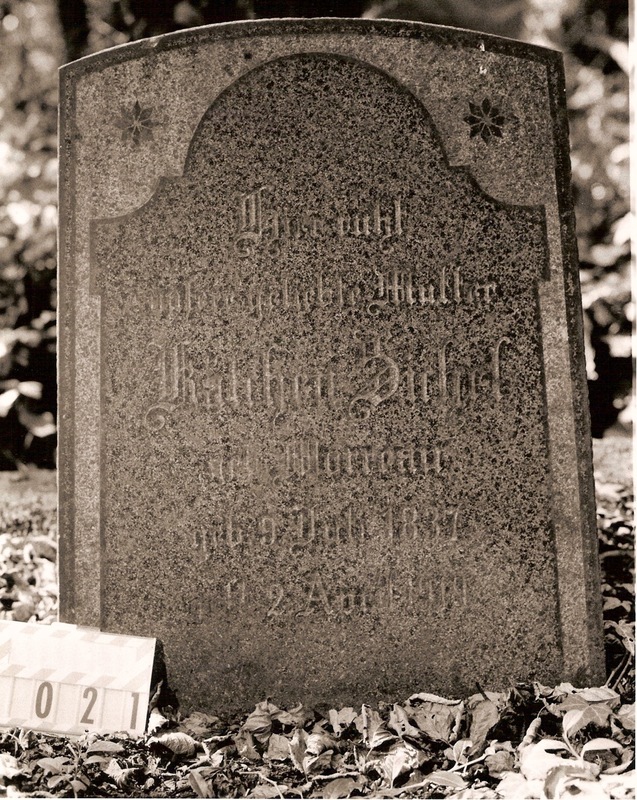 Elizabeth died on January 23, 1943 at Theresienstadt. Her son Heinz survived the war. 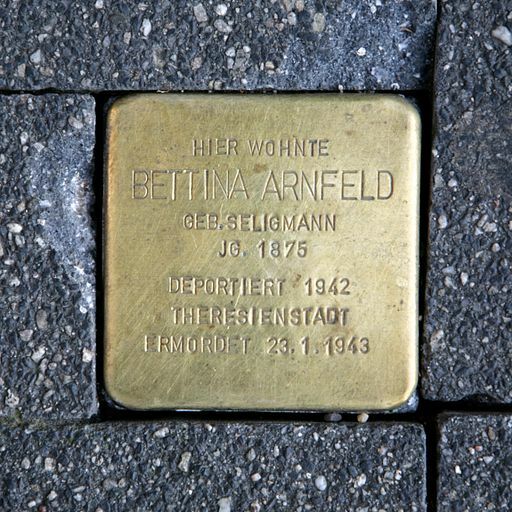 Eventually, once my cousin Wolfgang Seligmann found me, I learned more about “Elizabeth” Bettina Seligmann Arnfeld and her family, as I wrote about here and here. 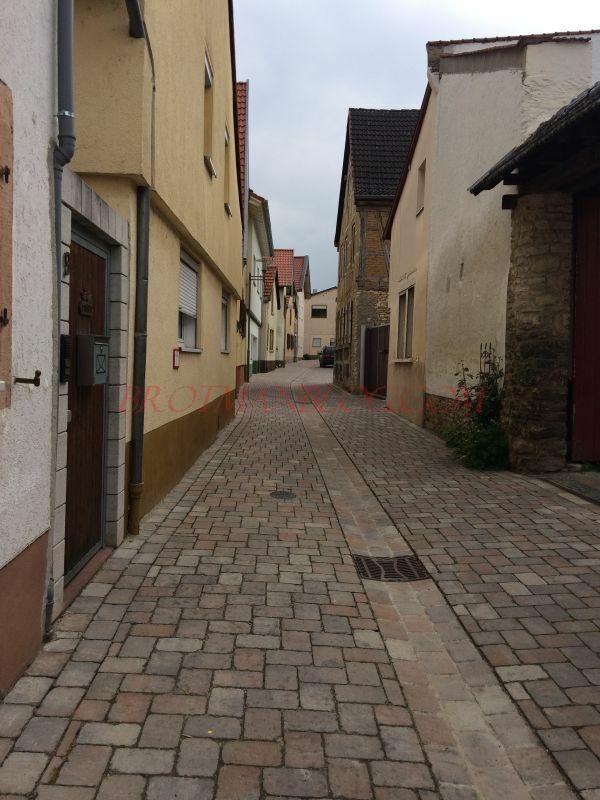 But back in November, 2014, I had not yet found Wolfgang nor had I yet found Beate Goetz, and my knowledge of my Seligmann relatives in Germany was very, very limited. 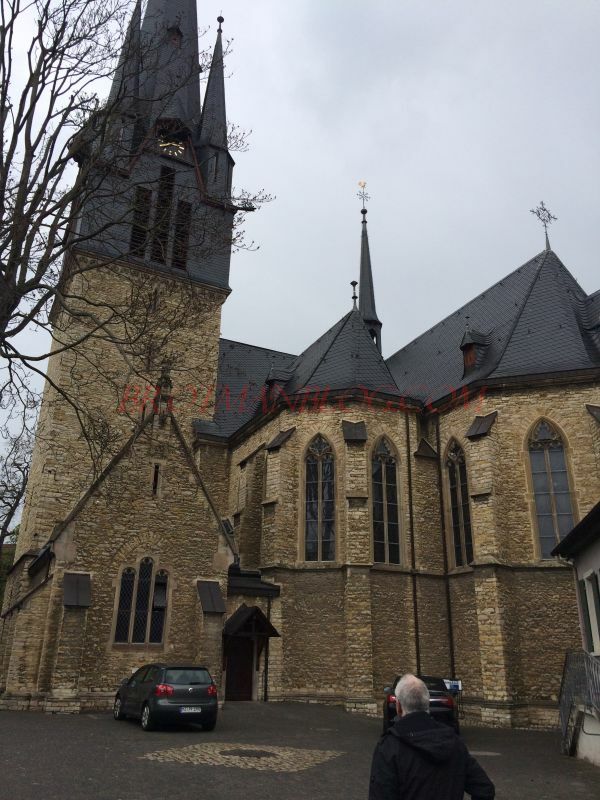 I found Leonara Morreau’s obituary and researched her a bit, but know of no reason that she would have had a connection to the Seligmanns in Germany. She was born, married, and lived in Cleveland. Her husband died in 1933, and she died in 1947. As far as I can tell, they never traveled to Germany. 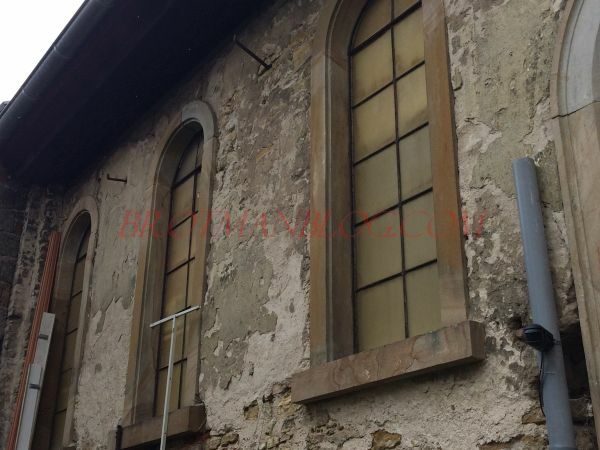 Leonara’s brother was Isaac Heller, who was also born in Cleveland, as was their father, Charles Heller. 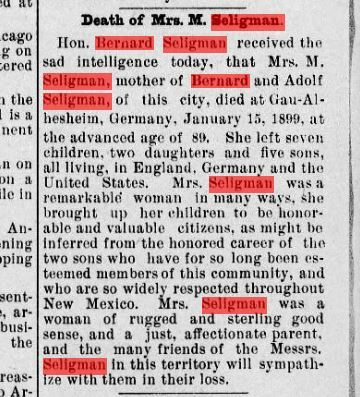 Although their grandfather was born in Germany, it was not even in the same region as the Seligmanns. Perhaps Leonara was active in trying to bring German Jews to the United States during Hitler’s reign, but I can find no evidence of that. Her obituary only states that she was active in charitable and religious causes. And that was as far as I got. 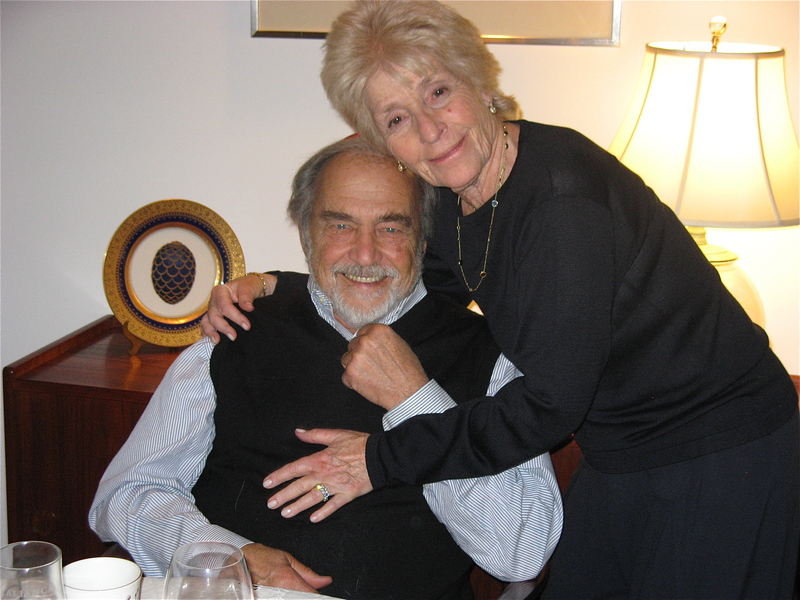 I put it aside and continued to work on my Seligmann family. 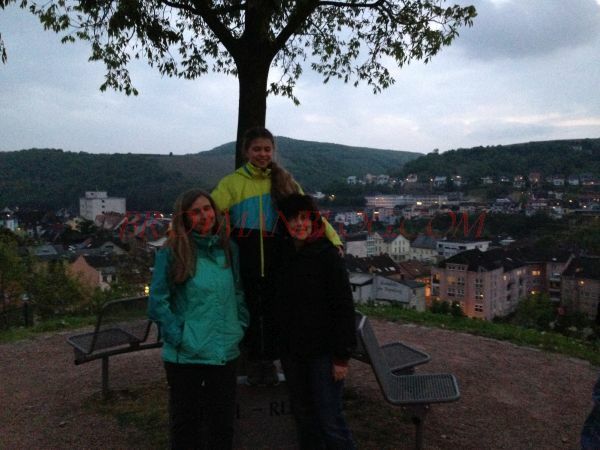 Beate connected with me a few weeks after that post in November, 2014, and Wolfgang found me in February, 2015, and I was then on an amazing and exciting run of good luck with their help and the help of Wolfgang’s mother Annlis. 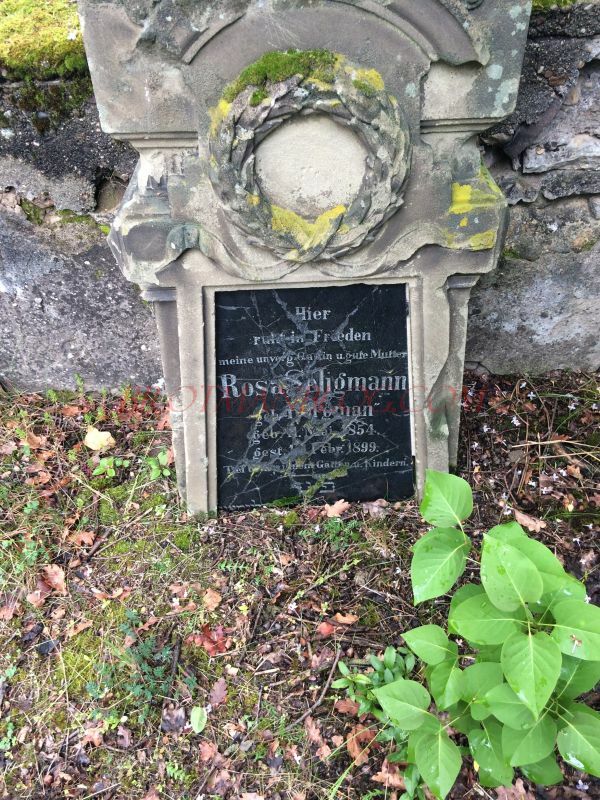 Many if not most of the holes in the Seligmann family tree were filled with our collective efforts. 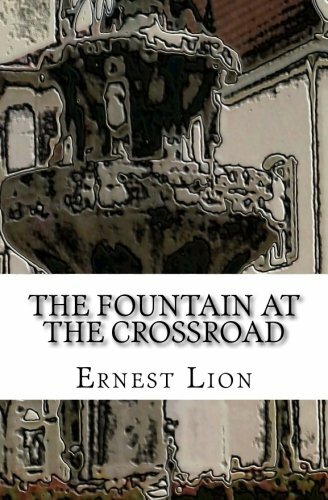 But I never returned to the question of Leonara Morreau. Leonara Morreau. 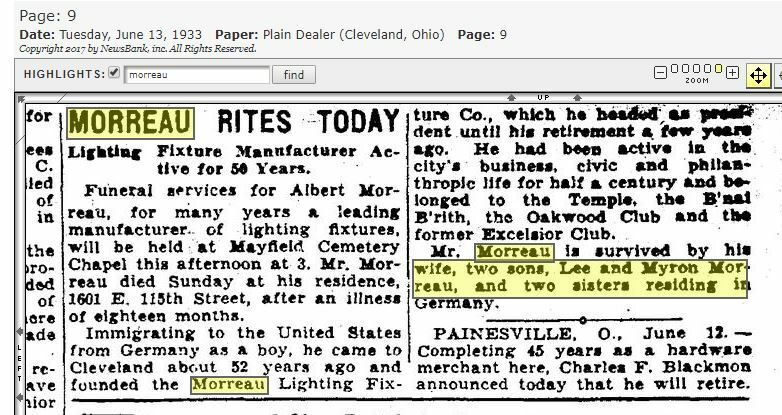 Now, I’m unsure if there are multiples in the same family, but in my ancestry, my great great grandfather Albert Morreau was married to a Lea Nora Morreau, multiple docuuments spell it differently, though. But she too, was born an Heller. Here in the states. 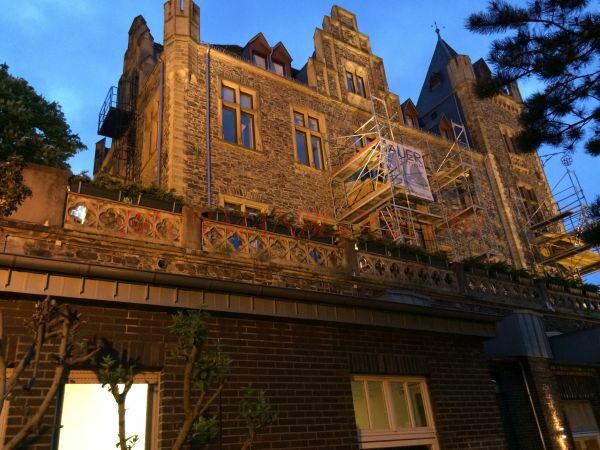 However, Albert was born in Germany, which is where the connection from Germany could be. When I read Shyanne’s comment, I could barely remember the whole question of “Leonara” Morreau (whose name is generally spelled Leanora but sometimes Lenora or Lea Nora). 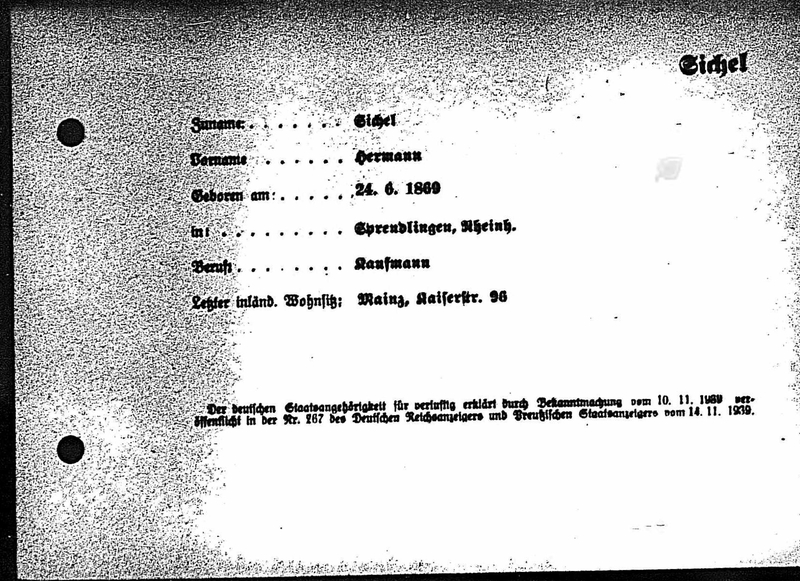 After all it had been almost three years before and just a passing question in the overall search for information about my Seligmann family. But I was intrigued and emailed Shyanne right away. After a flurry of emails, exchanges of information, and a review of the Seligmann family tree, Shyanne and I had the answer. And it was right before my eyes. 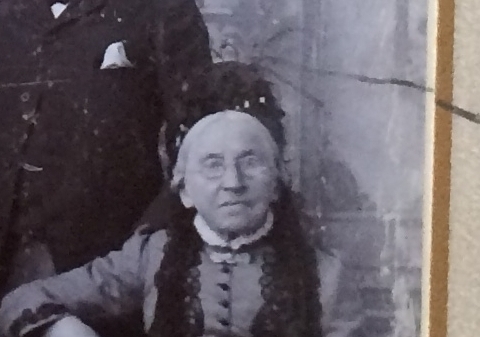 In all my initial research about Leanora back in the fall of 2014, I’d never thought to search for information about her husband, only about Leanora herself. The answer lay with her husband. As Shyanne had said, Leanora was married to a man named Albert Morreau. 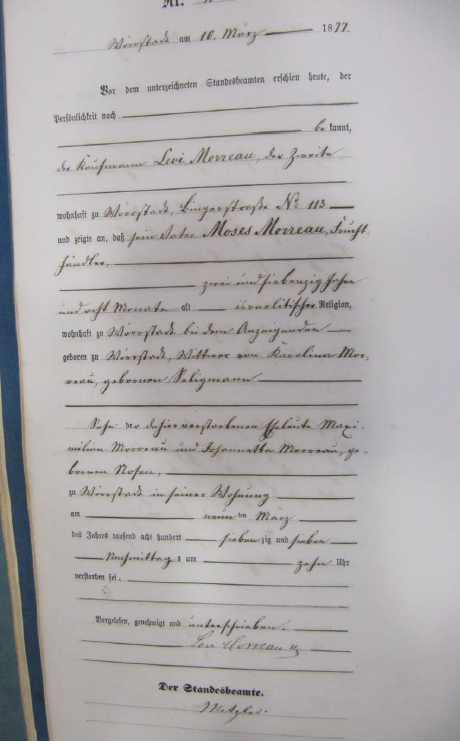 And although there’d been no Morreaus in my tree in November 2014 when I wrote that blog post that mentioned Leanora, there was now an Albert Morreau in my Seligmann family tree. I had entered him back in July 2015, just eight months after I’d written the post about Leonara Morreau, but I’d never made the connection. 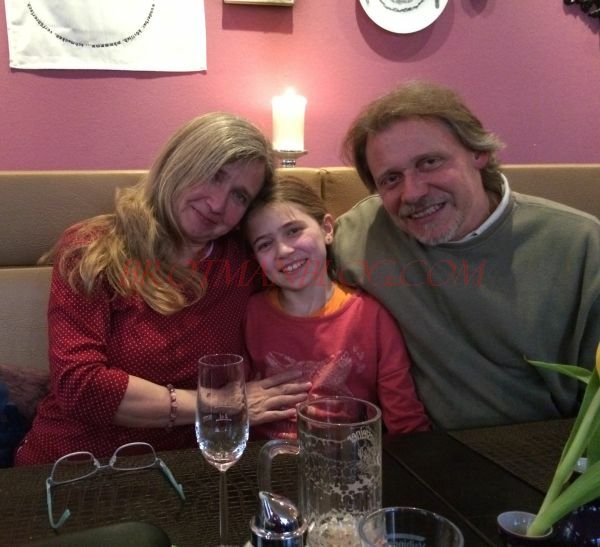 The next child of Jacob and Marta, Caroline, married Moses Moreau (?) 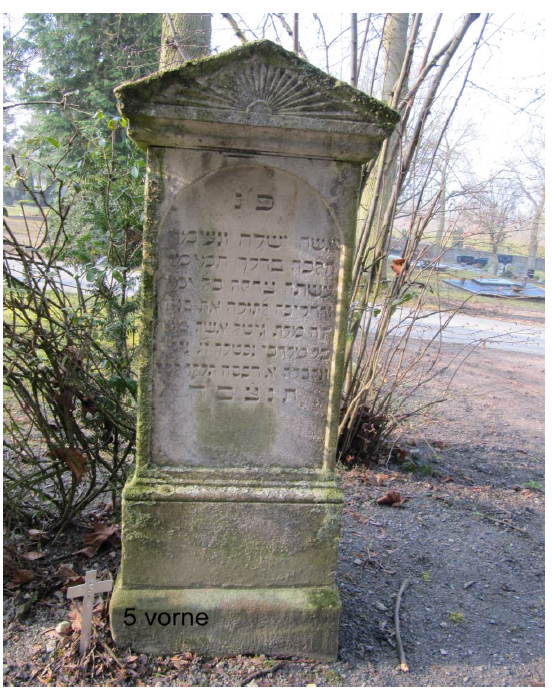 of Worrstadt, and they had four children whose names are written underneath; the first I cannot decipher (maybe Markus? ), but the other three are Albert, Bertha, and Alice. 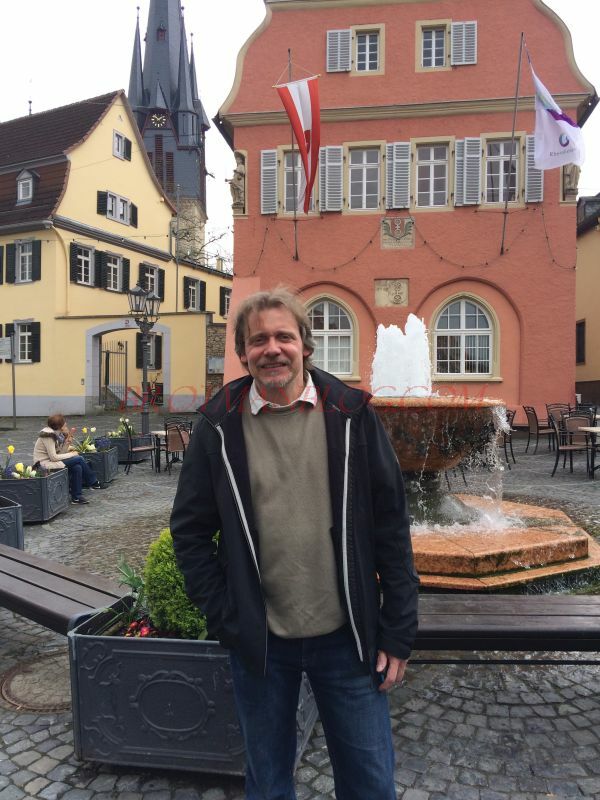 That is, the Albert Morreau who married Leanora Heller was my cousin—he was a descendant of Jacob Seligmann and Martha Mayer, my four-times great-grandparents, through their daughter Caroline, the sister of my 3x-great-grandfather, Moritz Seligmann. 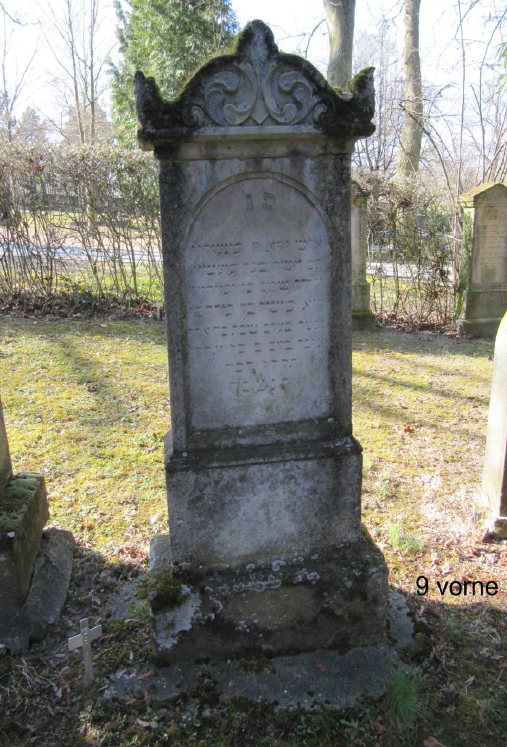 Caroline had married Moses Morreau (it is correctly spelled with two Rs) of Worrstadt. 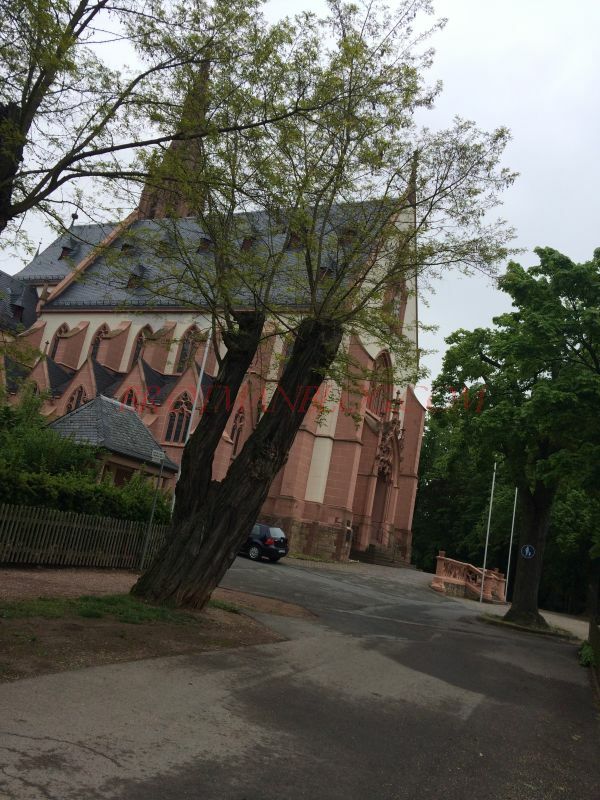 According to this tree, Albert was Caroline’s son. Shyanne found several other sources providing the same information. 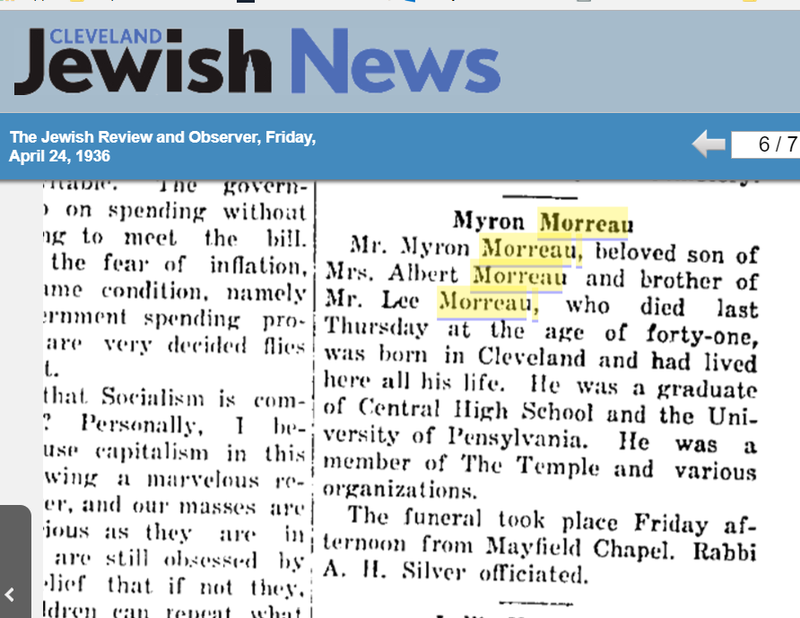 Shyanne and I were confused—was this the same Albert Morreau? 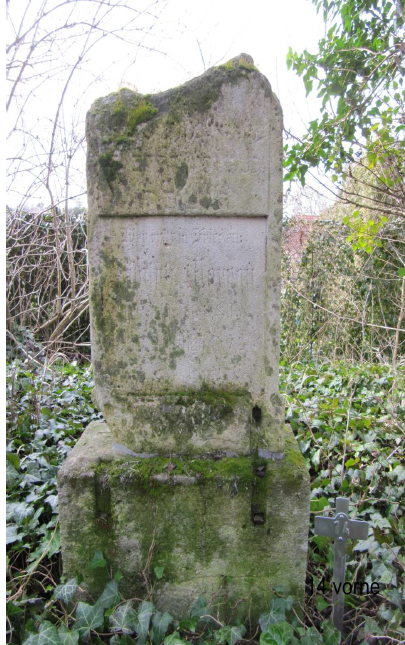 And if so, who were Leopold and Amelia Morreau? Could all these sources be wrong? 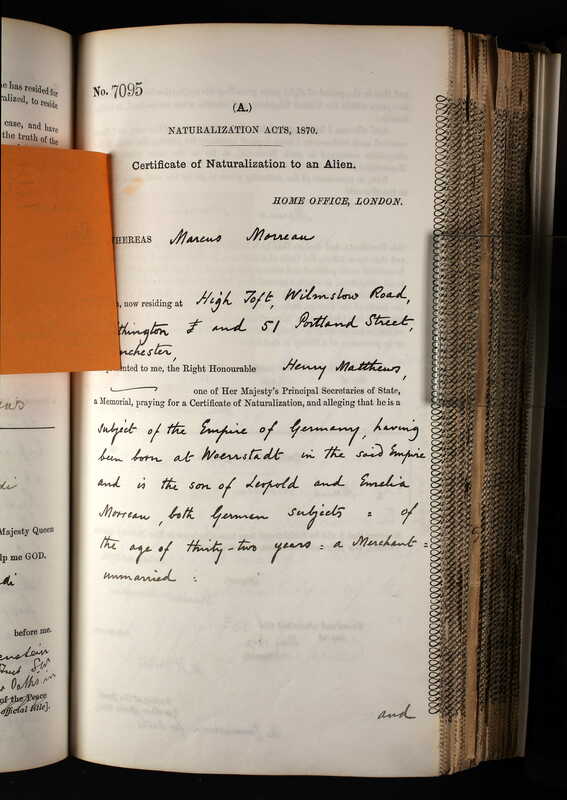 Then I found UK naturalization papers for Markus Morreau, the brother of Albert, and those also stated this his parents were Leopold and Emilia Morreau. 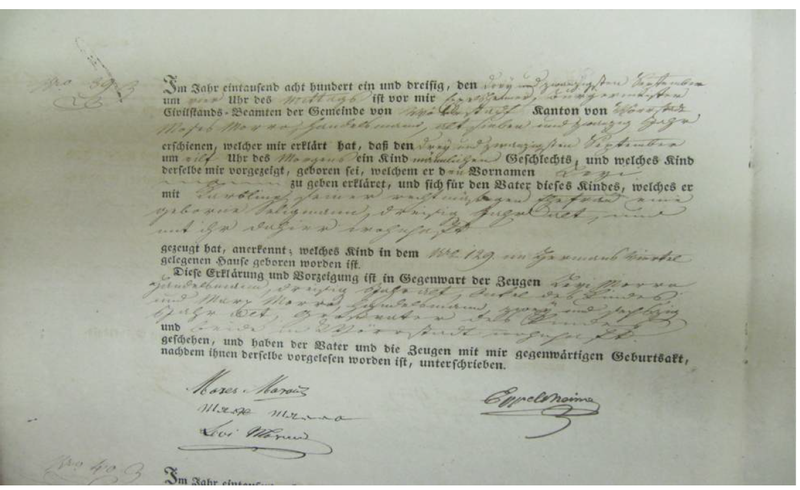 So why did Emil list Albert and Markus as the sons of Moses and Caroline on his family tree? 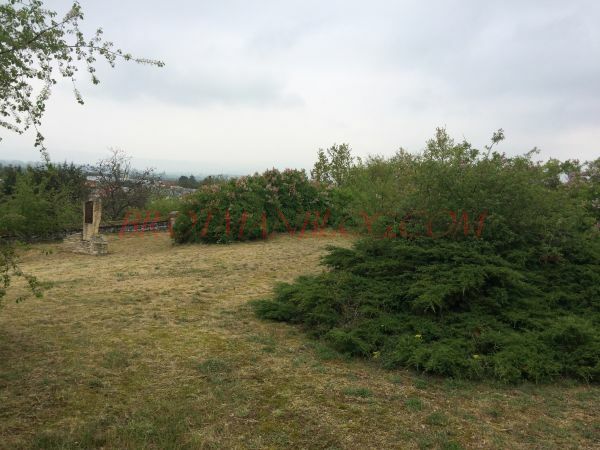 And who was Leopold Morreau? 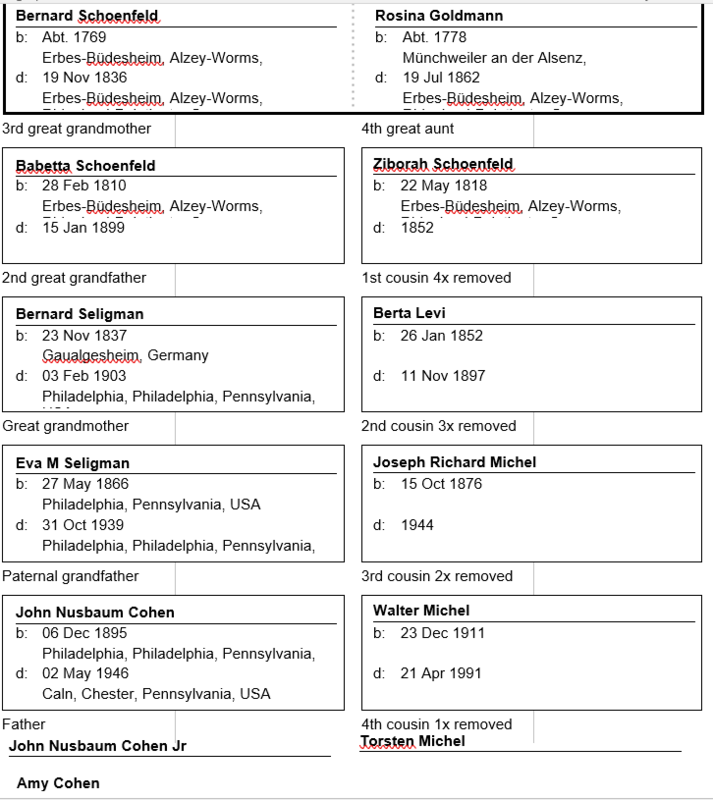 So Albert and his siblings Markus, Bertha, and Alice were not the children of Caroline Seligmann and Moses Morreau, but their grandchildren. If the sources naming Albert’s father as Leopold Morreau were correct, that meant that Caroline and Moses Morreau had a son named Leopold. 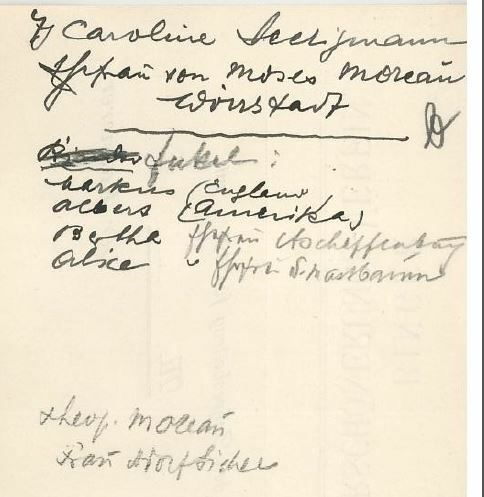 When Shyanne and I re-examined the page from the second handwritten family tree, we both concluded that one of the two names at the very bottom was Leopold Moreau. What do you think (see image directly above)? What do you think the second name at the bottom is? Meanwhile, Shyanne kept researching and so did I. 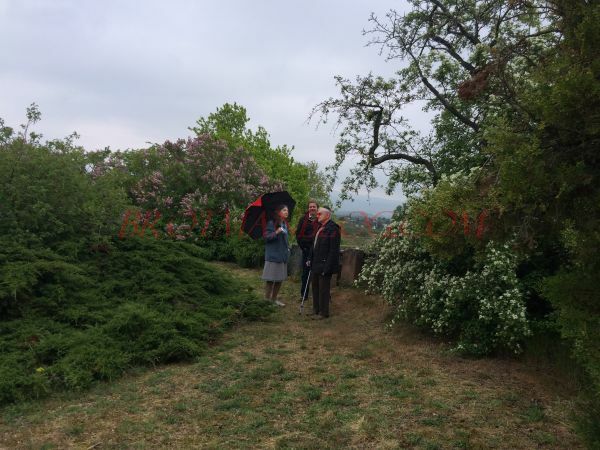 And we ran into some incredible luck when I contacted Michael S. Phillips, a tree owner on Ancestry who generously shared with us his research on the Morreau family. 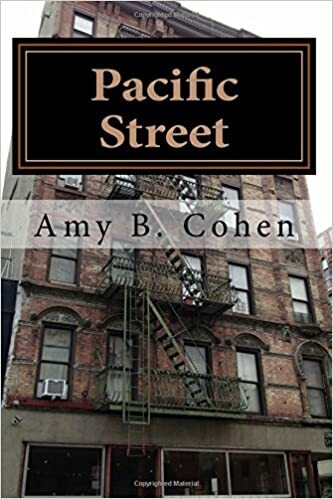 Then two weeks after Shyanne’s initial comment, I received another comment about the Morreau family from a man named Paul; I emailed Paul and learned that he was related to Otto Mastbaum, who had married Albert Morreau’s sister Alice. 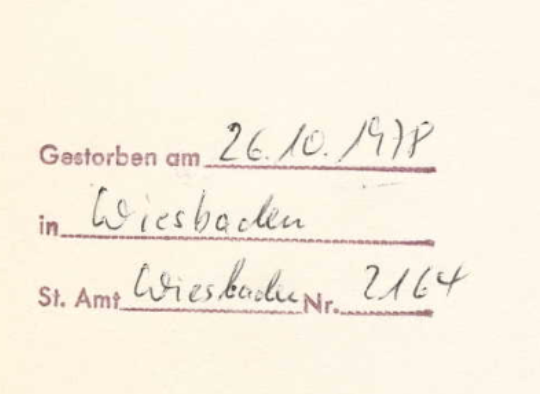 Otto Mastbaum was Paul’s great-grandmother’s brother. 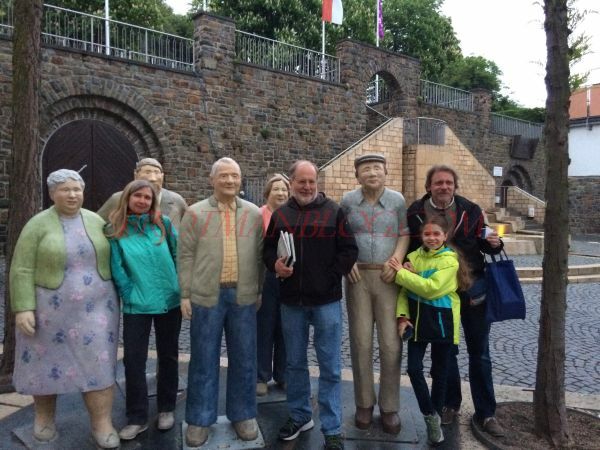 And Paul filled in more gaps on the Morreau family. 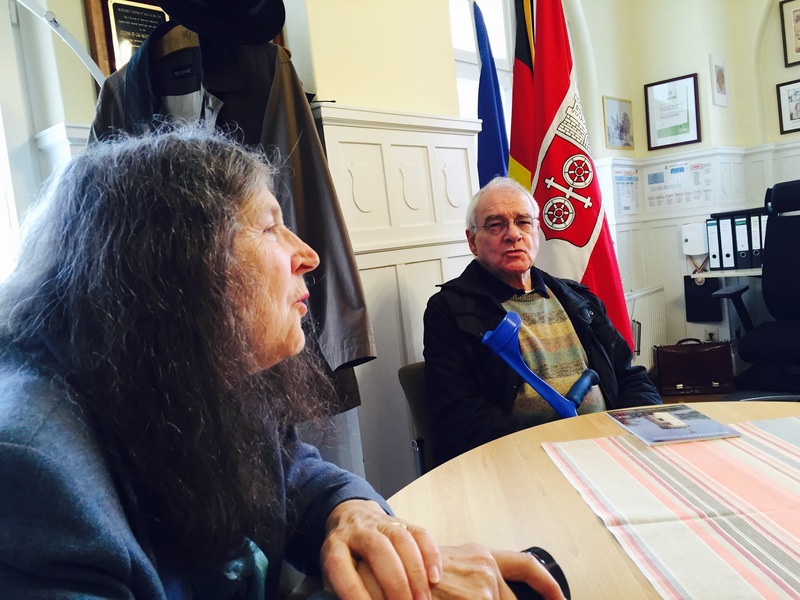 And I also learned more about Bertha Morreau and her husband Isidor Aschaffenburg with help from my friend in Cologne, Aaron Knappstein. 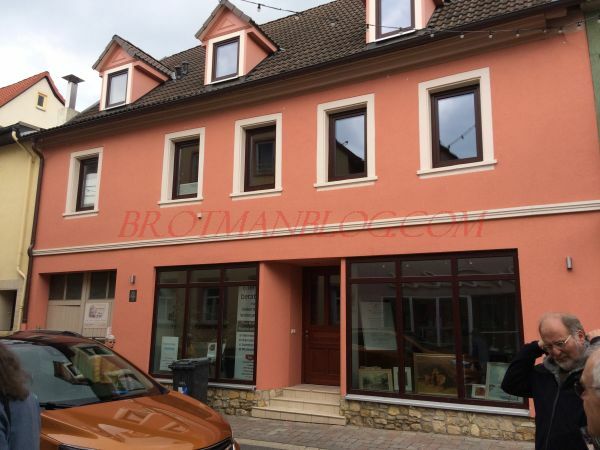 And then my friend Dorothee connected me with Friedemann Hofmann, a man in Worrstadt who was able to send me the birth, death, and marriage records for the entire Morreau family from Worrstadt. In subsequent posts, I will follow up and fill in these details and tell the full story of my Morreau cousins. 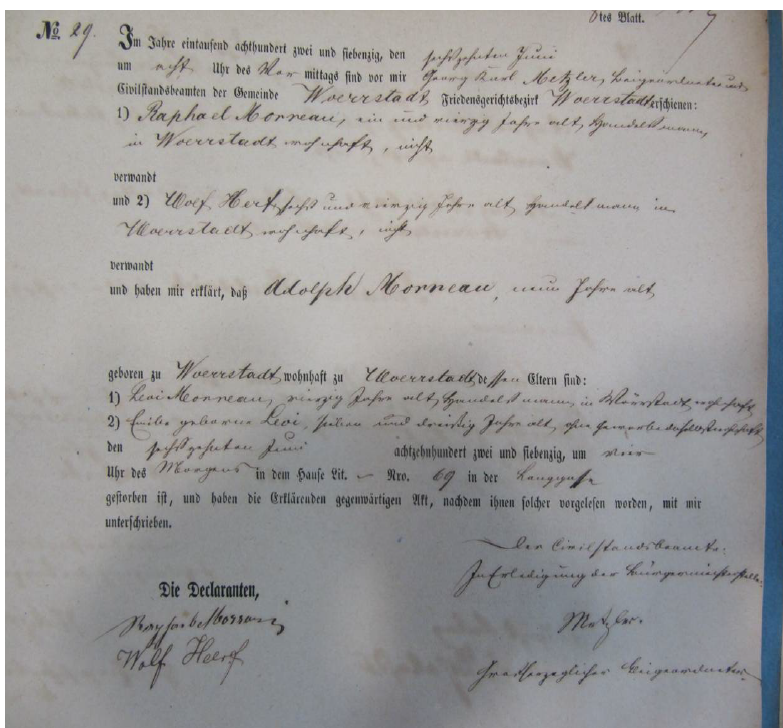 But for now I just want to thank Shyanne (who I now know is my fifth cousin, once removed,), Paul, Aaron, Michael, Dorothee, and Friedemann for all their help in filling in these gaps in the Seligmann family tree. This whole experience has been a real lesson to me. Even when you think you are “done,” there is always more to learn. And there are always incredibly generous people out there to help you do so. 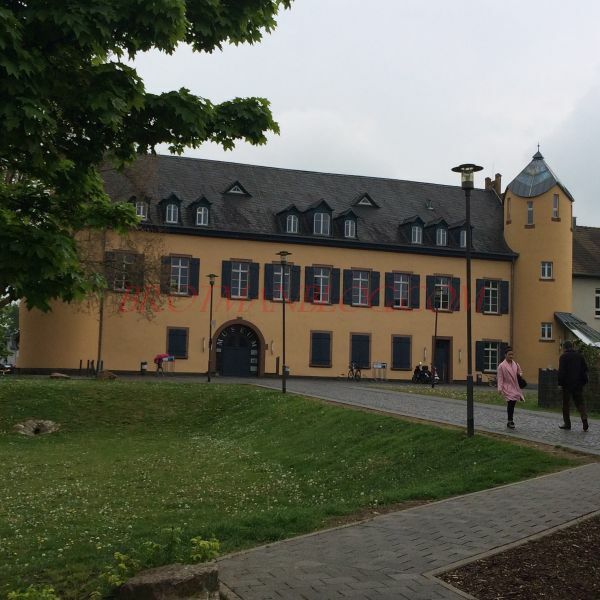 In July, I received an email from my friend Beate Goetz; Beate is the woman who not only was our guide when we visited Bingen in May—she was one of the first people from Germany who helped me with my research, starting back almost three years ago. 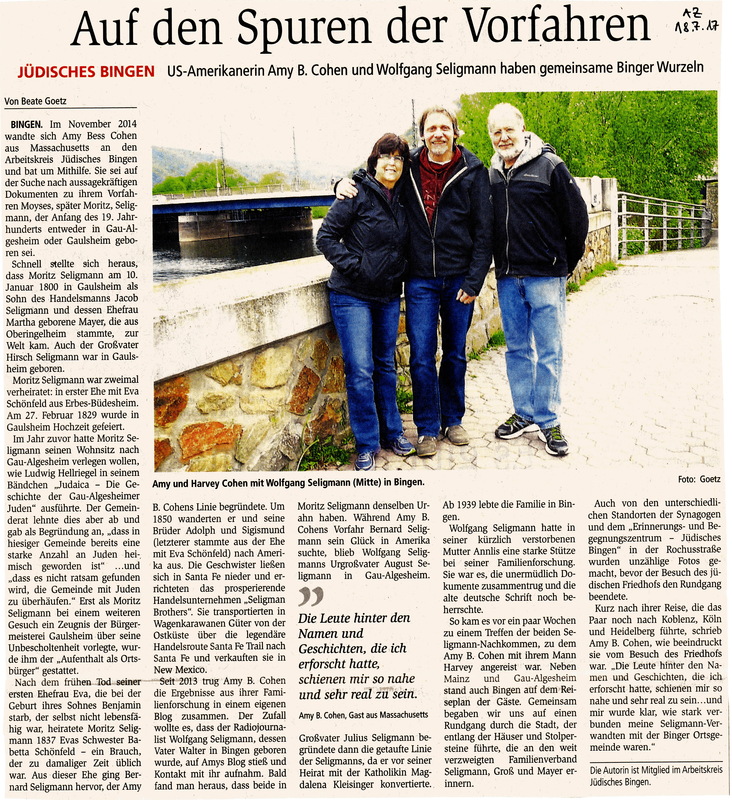 We’d had a lovely time with Beate while in Bingen, and she wrote an article about our visit for the local newspaper, Allegemeine Zeitung. 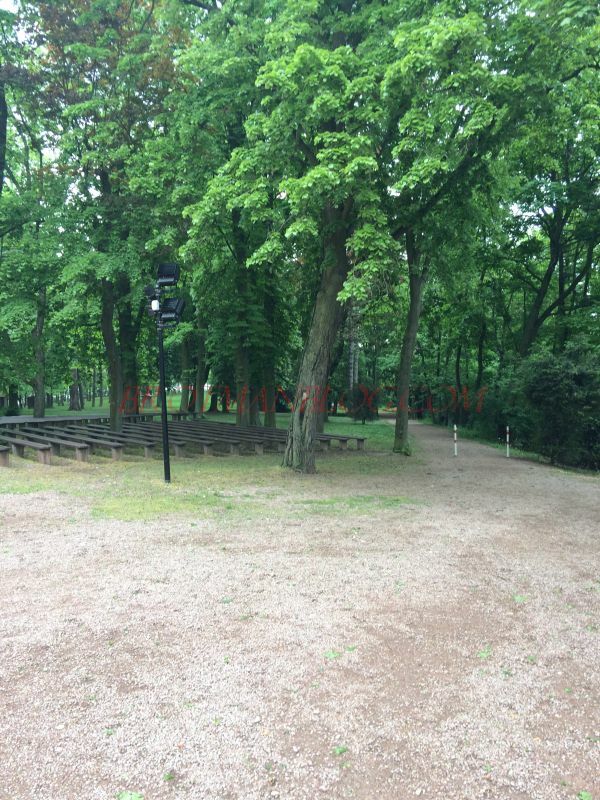 It was wonderful to relive the experience through Beate’s eyes and remember our time together. 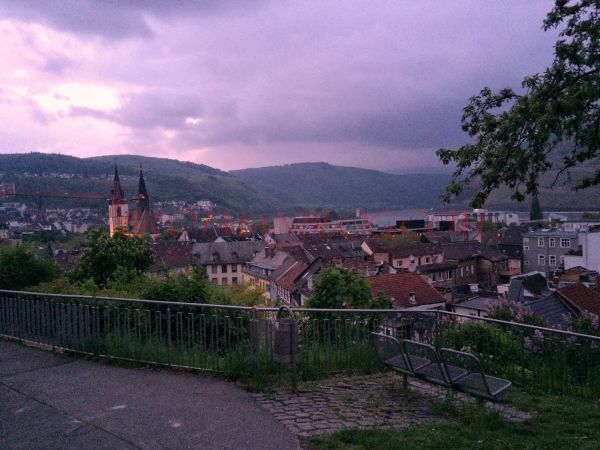 US-American Amy B. Cohen and Wolfgang Seligmann have Common Bingen roots. 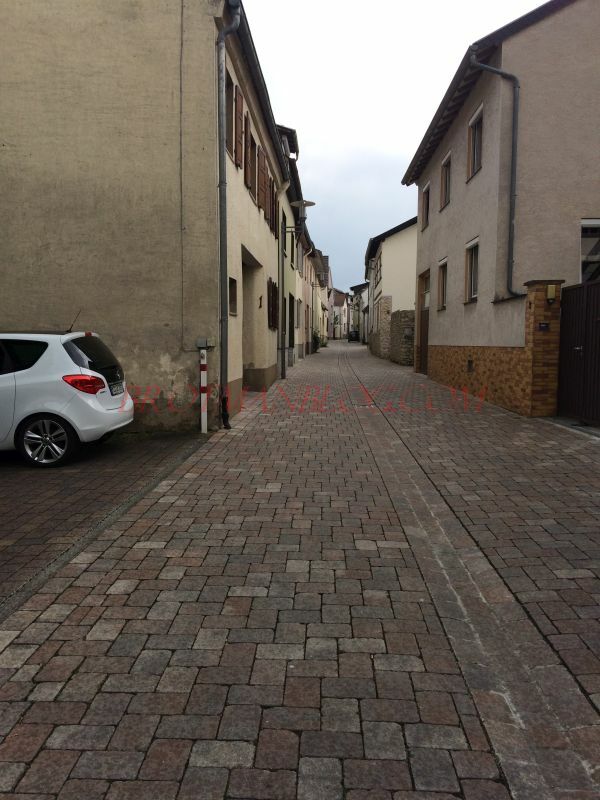 In November 2014, Amy Cohen from Massachusetts turned to the Arbeitskreis Judische and asked for help. 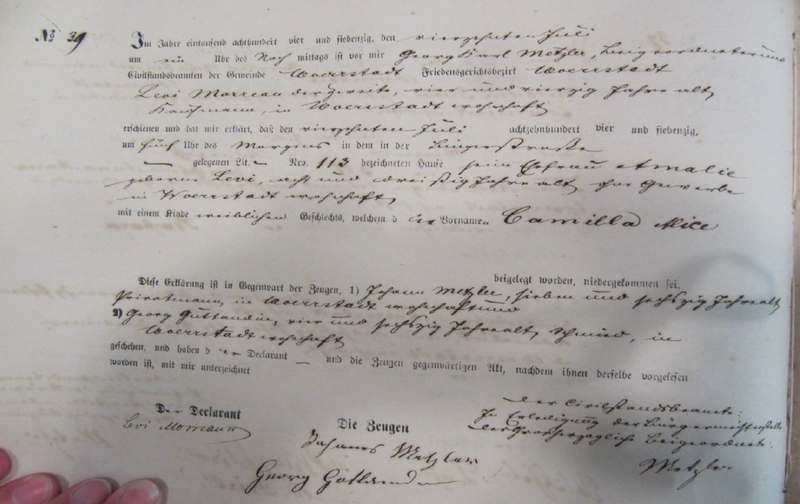 She was in search of meaningful documents about her ancestor Moses, later Moritz, Seligmann, who was born in either Gau-Algesheim or Gaulsheim in the 19th century. 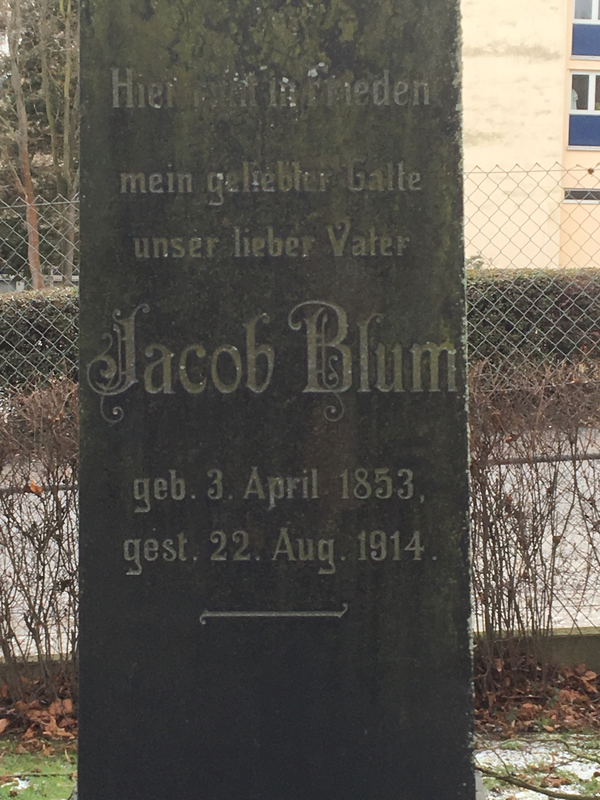 It soon became apparent that Moritz Seligmann was born on January 10, 1800, in Gaulsheim, the son of the merchant Jacob Seligmann and his wife Martha nee Mayer, who came from Oberingelheim. 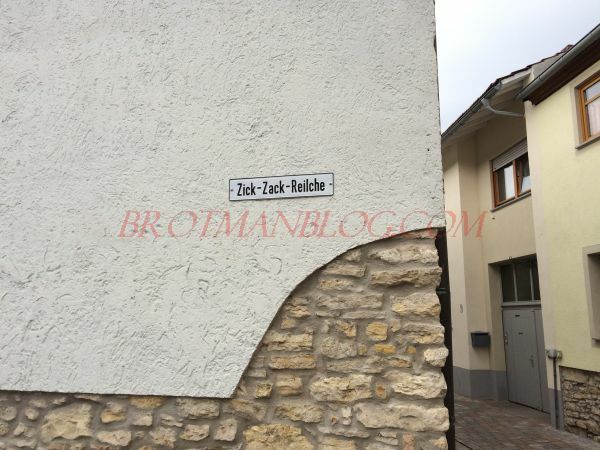 Also, his grandfather Hirsch Seligmann was born in Gaulsheim. 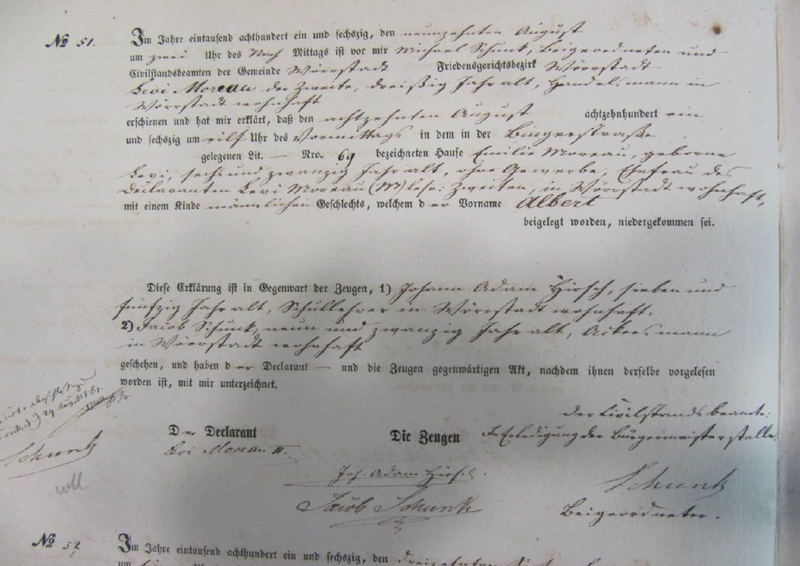 Moritz Seligmann was married twice: first with Eva Schoenfeld from Erbes-Buedesheim. 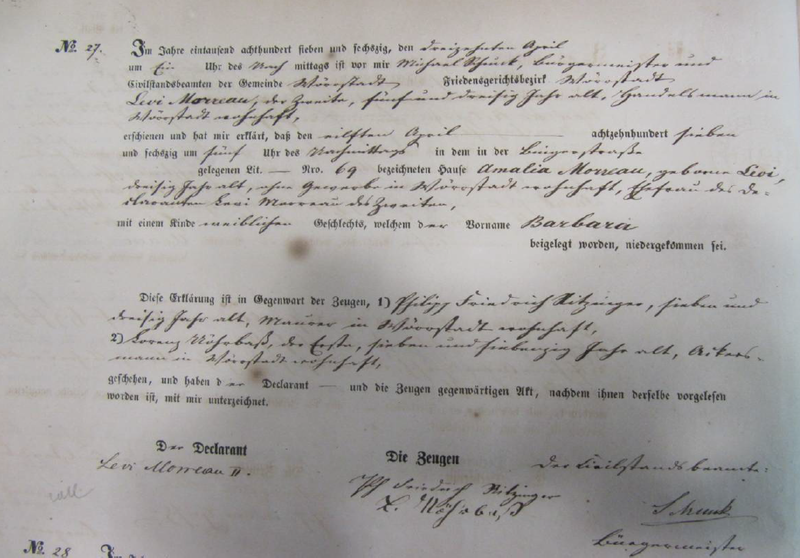 The wedding was on February 27, 1829, in Gaulsheim. 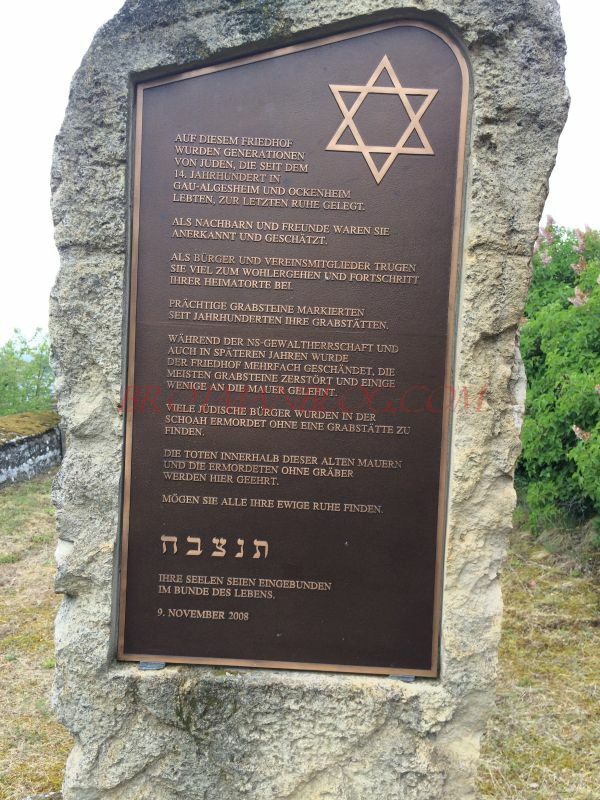 The year before, Moritz Seligmann had wanted to transfer his place of residence to Gau-Algesheim, as Ludwig Hellriegel wrote in his little book, The History of the Jews of Gau-Algesheim. 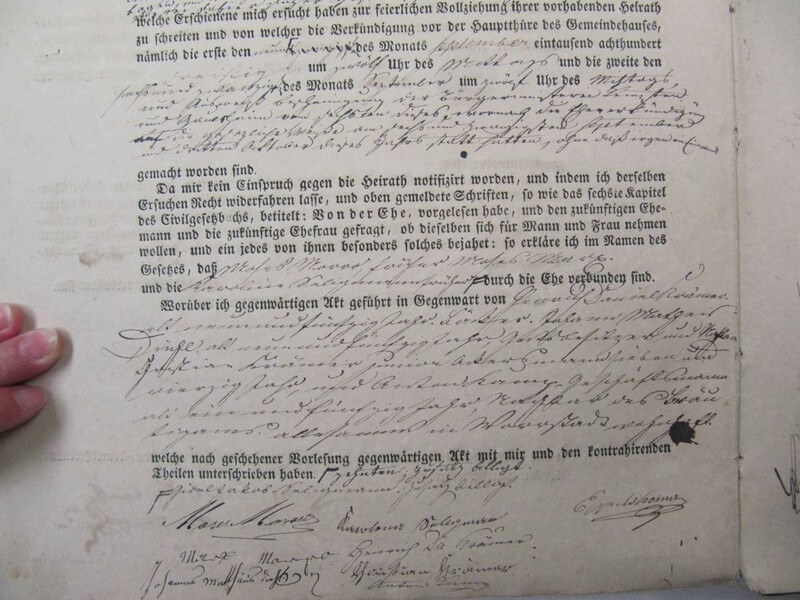 However, the town council rejected this and stated that “there are already a large number of Jews in the local community.” And “that it is not advisable to overpower the church with Jews.” But when Moritz Seligmann submitted a testimony to the mayor’s office of Gaulsheim of his unblemished reputation, he was allowed to become a citizen of the city. 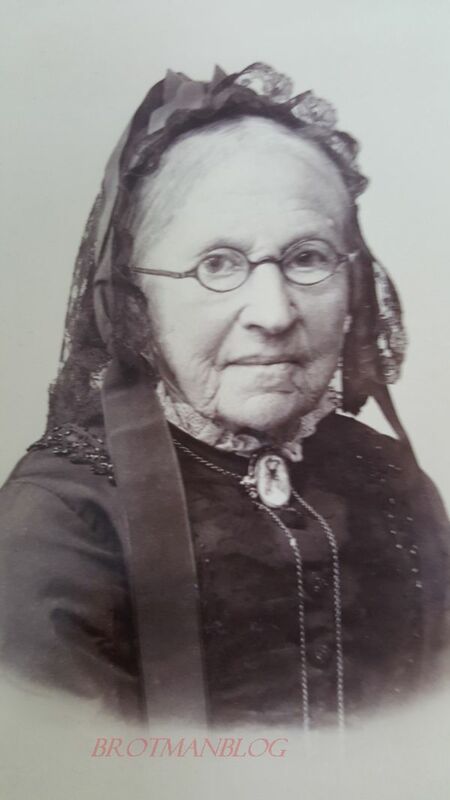 After the death of his first wife Eva on the birth of their son Benjamin, Moritz Seligmann married her sister Babetta Schönfeld, as was customary at that time. 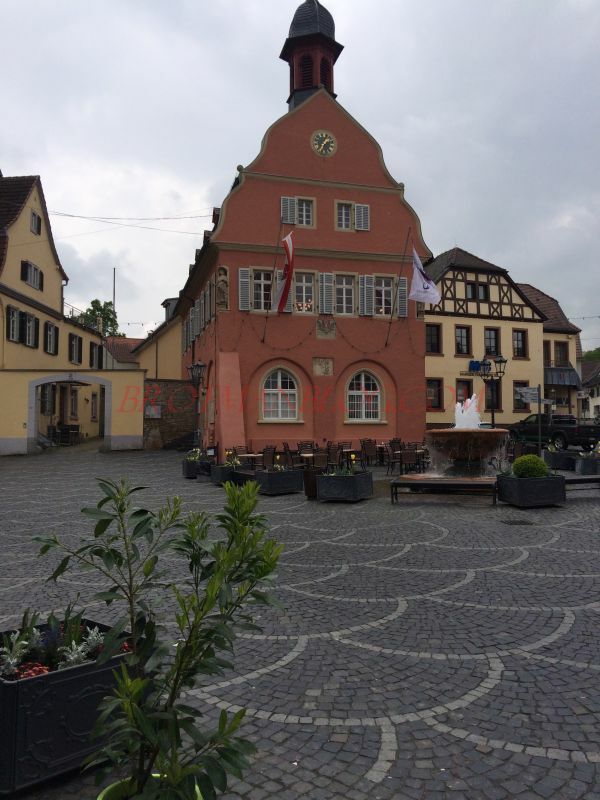 Bernard Seligmann, Amy Cohen’s ancestor, came from this marriage. 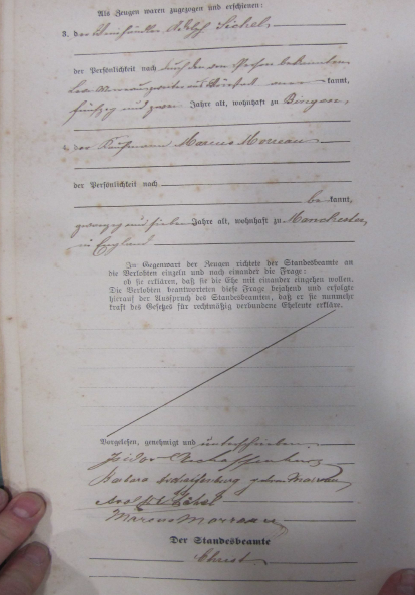 He and his brothers Adolph and Sigismund (from the marriage with Eva) went to America around 1850. 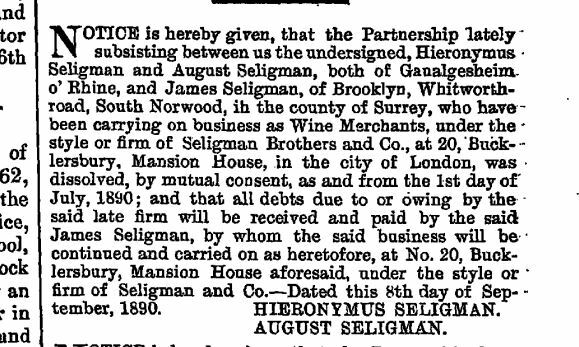 The brothers settled in Santa Fe and established the prosperous business, Seligman Brothers. 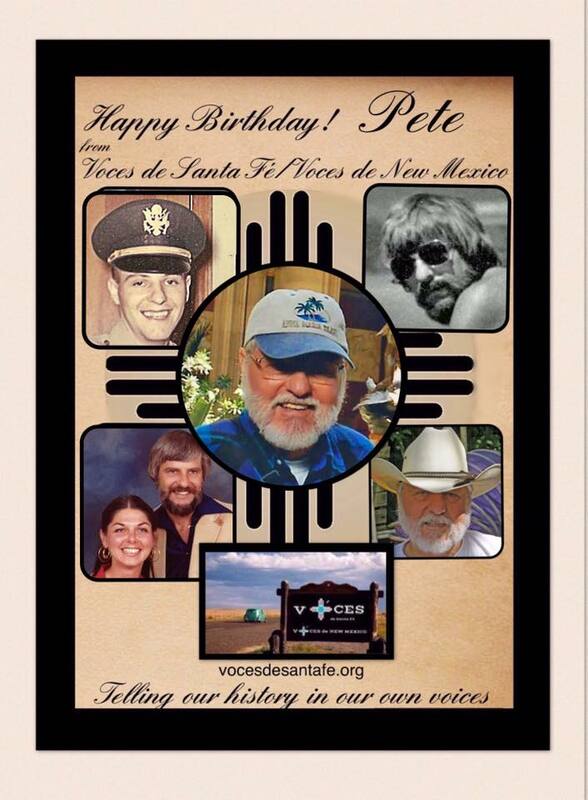 They transported goods from the East Coast on the Santa Fe Trail and sold them in Santa Fe. 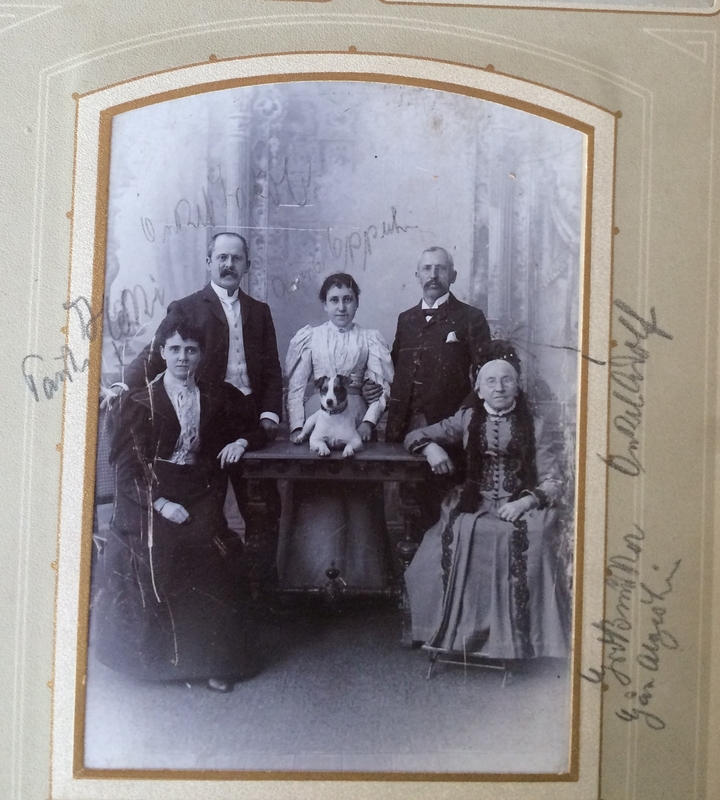 Since 2013 Amy Cohen has been collecting her family history research in a blog. 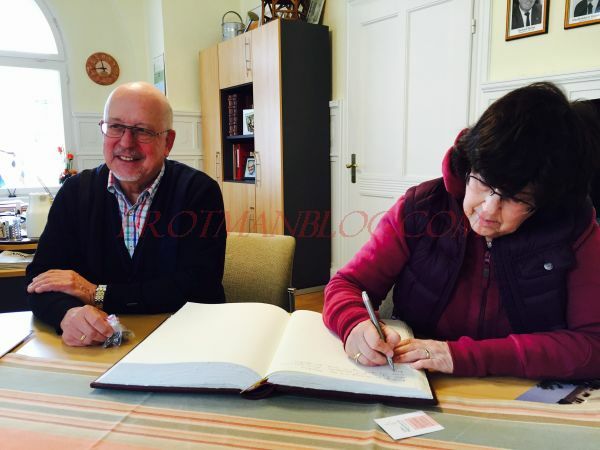 The coincidence was that radiojournalist Wolfgang Seligmann found Amy’s blog and soon they found out that they have the same ancestor in Moritz Seligmann. 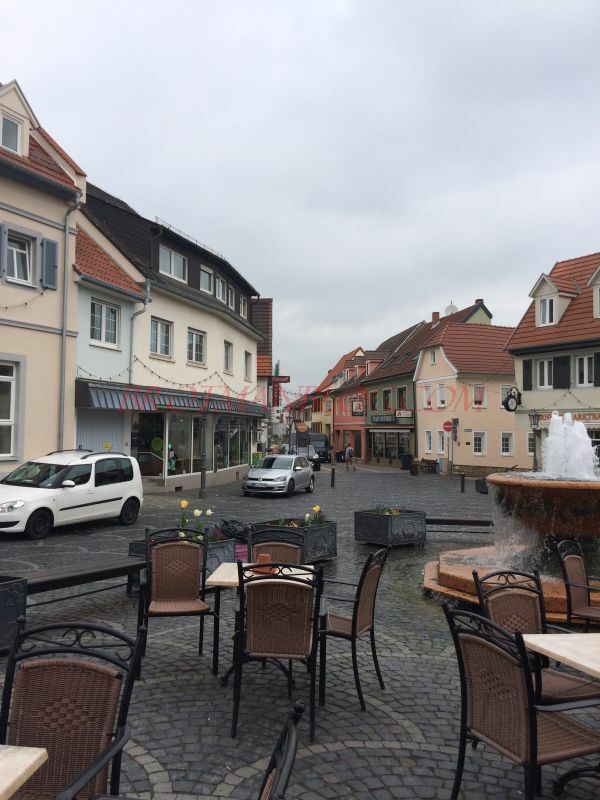 While Amy’s ancestor Bernard Seligman was finding happiness in America, Wolfgang’s great-grandfather August had stayed in Gau-Algesheim. 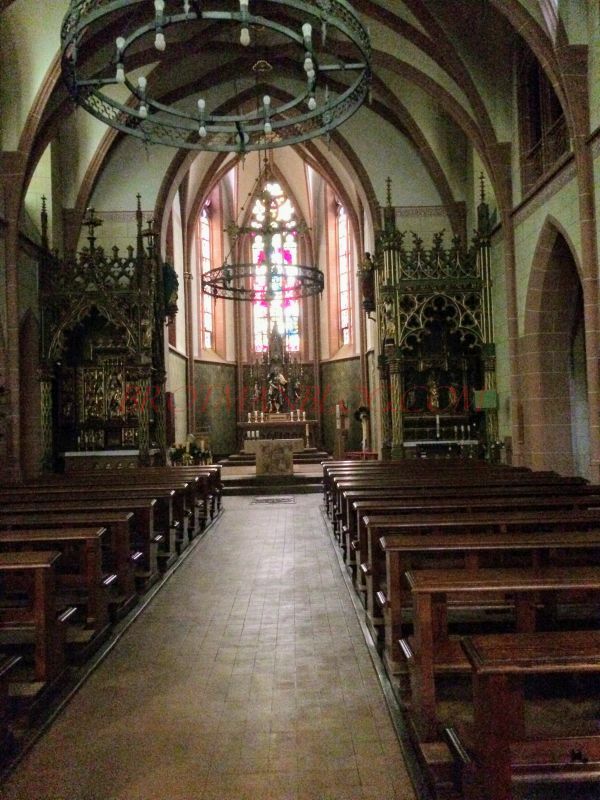 His grandfather Julius Seligmann had started the Christian line in the family as he converted when he married Magdalena Kleisinger, who was Catholic. 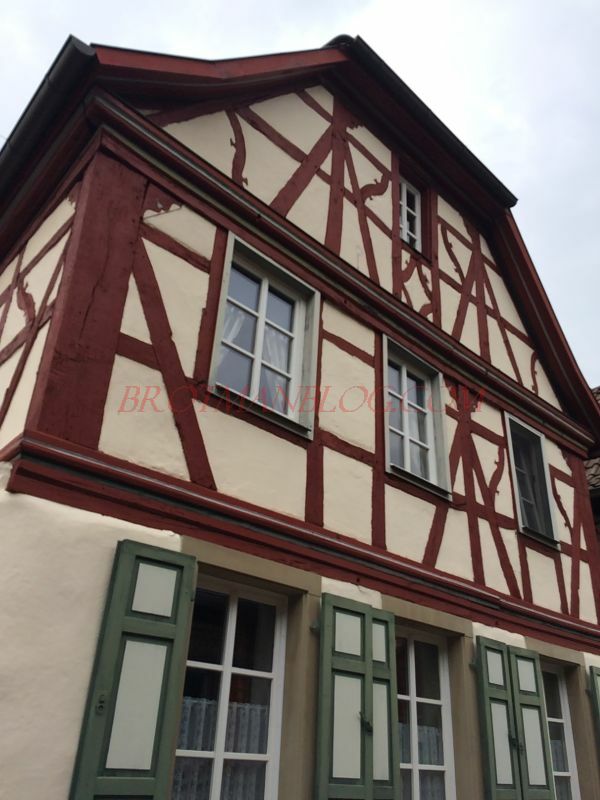 From 1939, the family lived in Bingen. 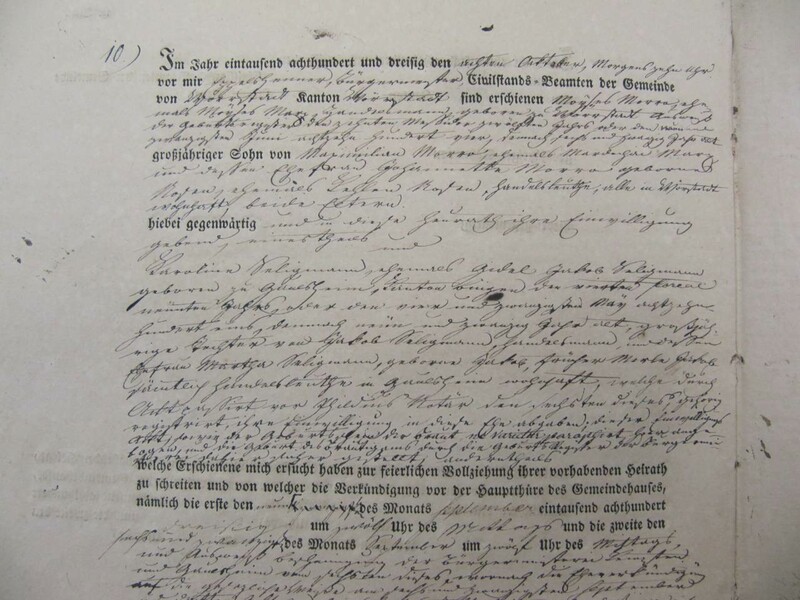 Wolfgang Seligmann had strong support in his family research from his recently deceased mother, Annlis, who tirelessly gathered the documents and mastered the old German script. 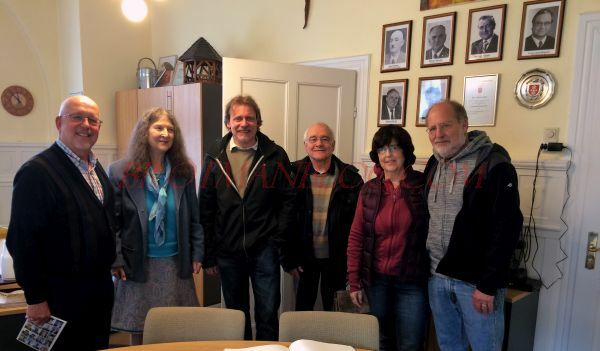 So a few weeks ago the two Seligmann descendants met when Amy Cohen came with her husband Harvey. 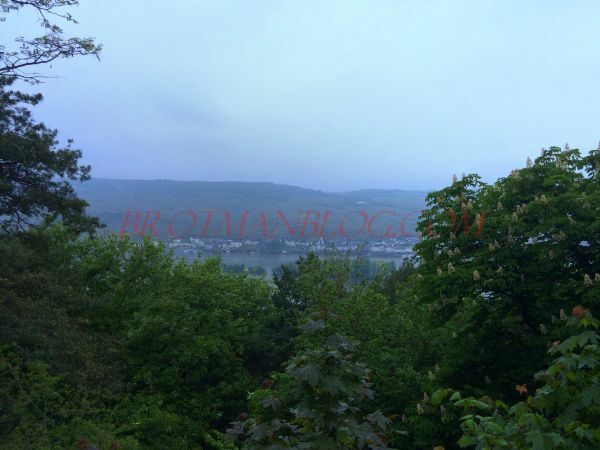 In addition to Mainz and Gau-Algesheim, Bingen was on the travel schedule of the guests. 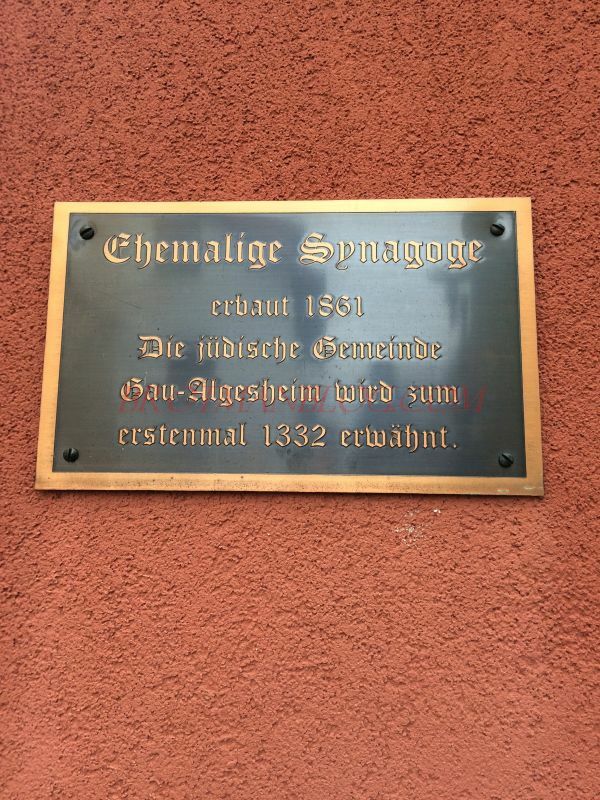 Together we went on a tour of the town that led along the houses and stolpersteine to remember the extensive family associations of the Seligmann, Gross, and Mayer families. 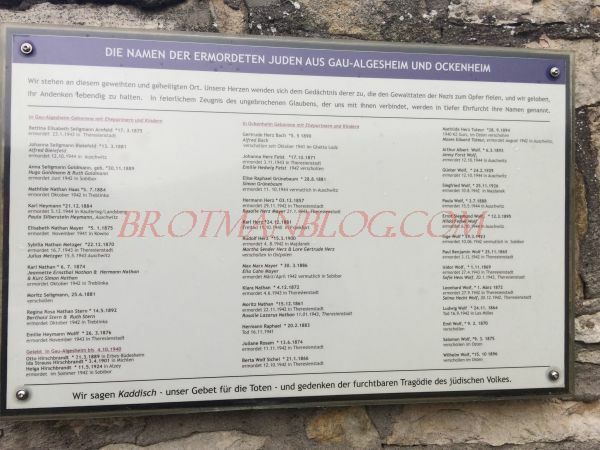 Also, we visited the synagogues and the Memorial and Meeting Center of Judische Bingen in Rochusstraße and also took countless photos before the visit to the Jewish cemetery ended the tour.